Below is an AMAZING documentary on Steve McQueen that features Loren Janes speaking about Steve McQueen before Loren's dementia occurred. I took the updates from the past few days on the Loren Janes / Steve McQueen story and added them in chronological order to the end of The Loren Janes Submariner Mystery. 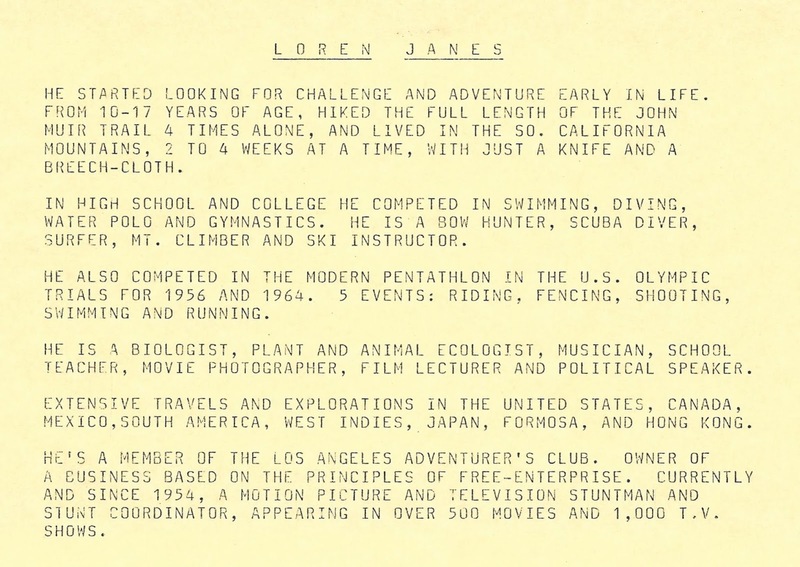 The video below @ 26 minutes refers to Loren Janes as "Steve McQueen's friend and stuntman." 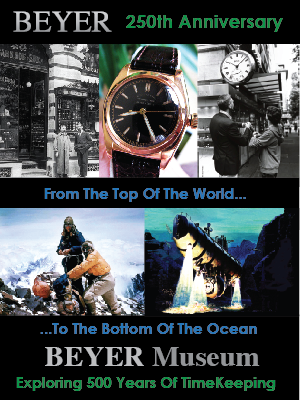 We have been exploring a story that involves Rolex being witness to historical drama, in a what feels like you are on a crazy Roller Coaster ride with the Loren Janes/Steve McQueen Rolex Submariner story. I have been doing my best to separate the fact from the fiction in that story. 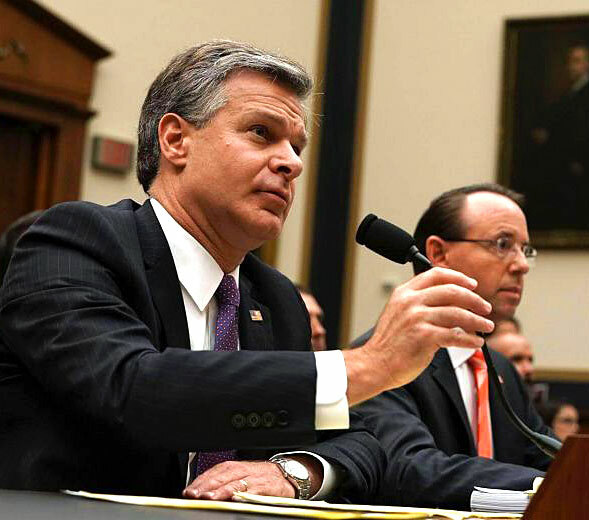 Thus I thought it might make sense to take a short break and witness another insane crazy Roller coaster ride that Rolex is bearing witness to as we see FBI Director, Christopher Wray wearing his Rolex in this House panel on the Clinton Inquiry yesterday. This story is a follow-up to the original story I published between June 5 -10th, 2018. If you really want to understand this story, I HIGHLY RECOMMEND you first read my original story titled "Loren Janes Submariner—The Rolex Phoenix That Rose From The Flame." What can be said about men who lived and died when they can no longer speak for themselves? Everything, and nothing...they took their secrets to their graves, didn't they? This is one of the craziest, most bizarre Rolex stories I have ever told, and I will try—as best as I am able—to share Loren Janes story, including his foibles with the help of his family, friends, and foes. First and foremost this is a human interest story, coupled with a Rolex Submariner that refused to be destroyed...In many ways, this story plays out like a Greek Tragedy, coupled with an Agatha Christie mystery novel, wrapped in a Hollywood Blockbuster. This story is about the two men pictured above in Hong Kong on the set of the 1966 major motion picture titled, "The Sand Pebbles". 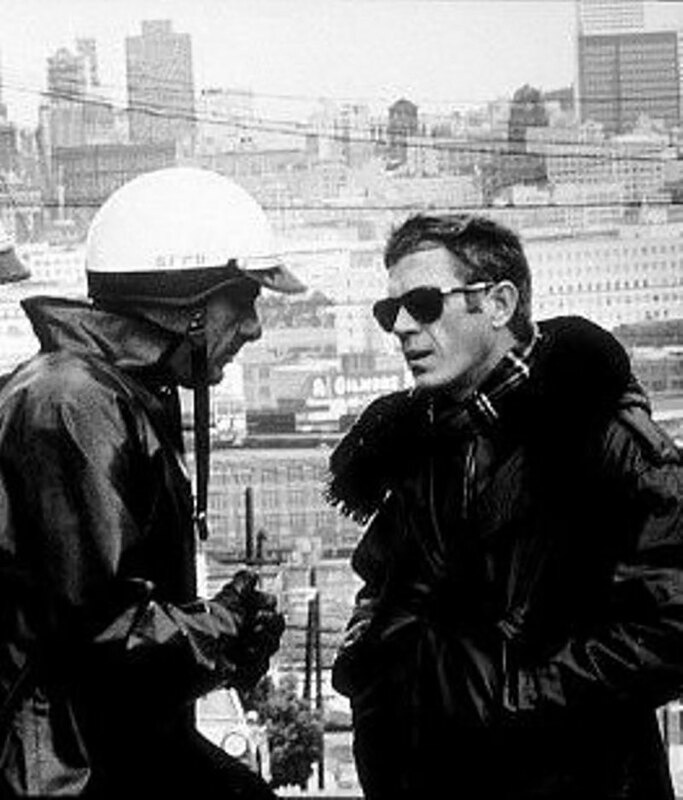 On the left, we see The King Of Cool, Steve McQueen, whom I have written about extensively in the past. On the right, we see Loren Janes who served as the stunt coordinator on the movie. Just two dudes, hanging out, right? Or is there more to this photo? This next photo was taken a decade and a half later, on the set of the 1980 Steve McQueen movie titled, The Hunter. 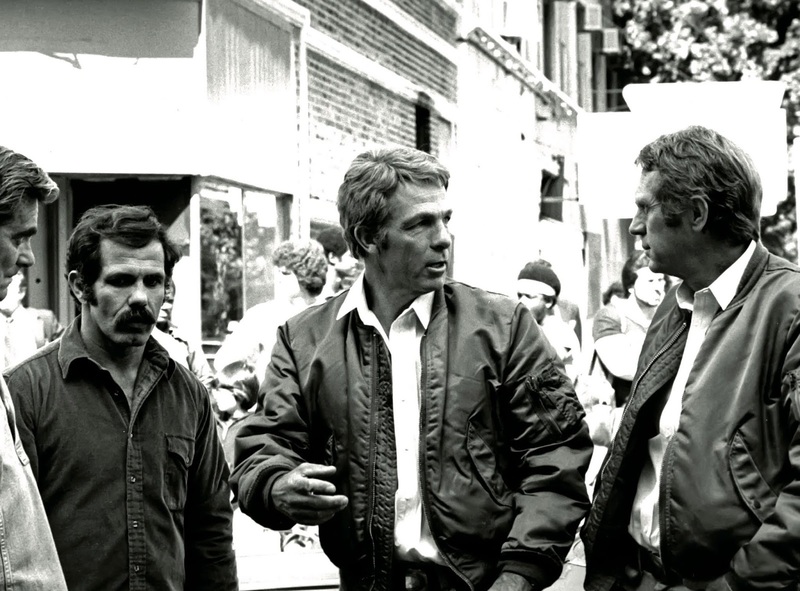 In the photo, from left to right we see movie director Buzz Kulik, Pat Johnson, Loren Janes and Steve McQueen. 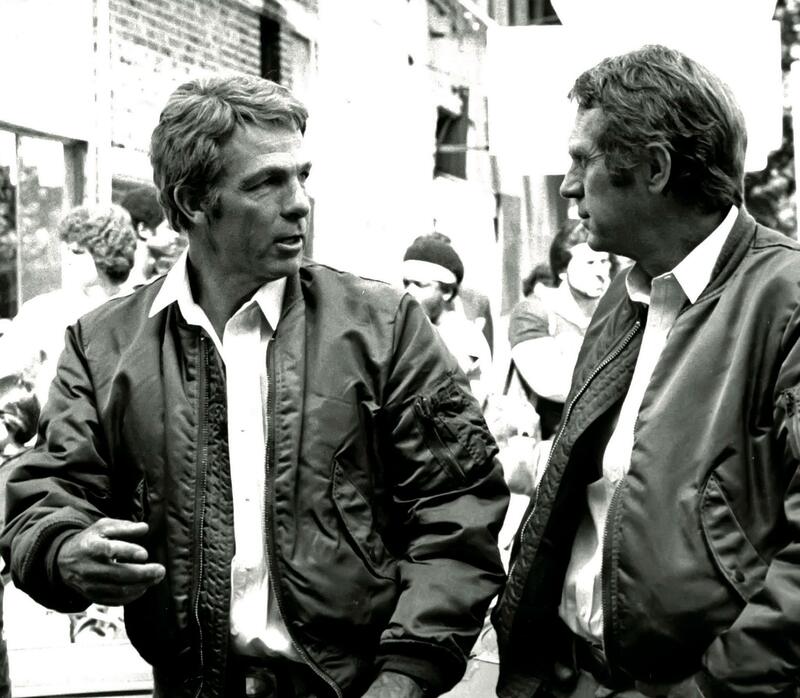 The Hunter was Steve McQueen's last movie, and as we clearly see Loren Janes was McQueen's stunt double and looked like his twin—Alpha Industries MA-1 bomber flight jacket with the orange liner and all...not to mention matching Rolex Submariner models on their wrists, but where did these Submariner models come from? 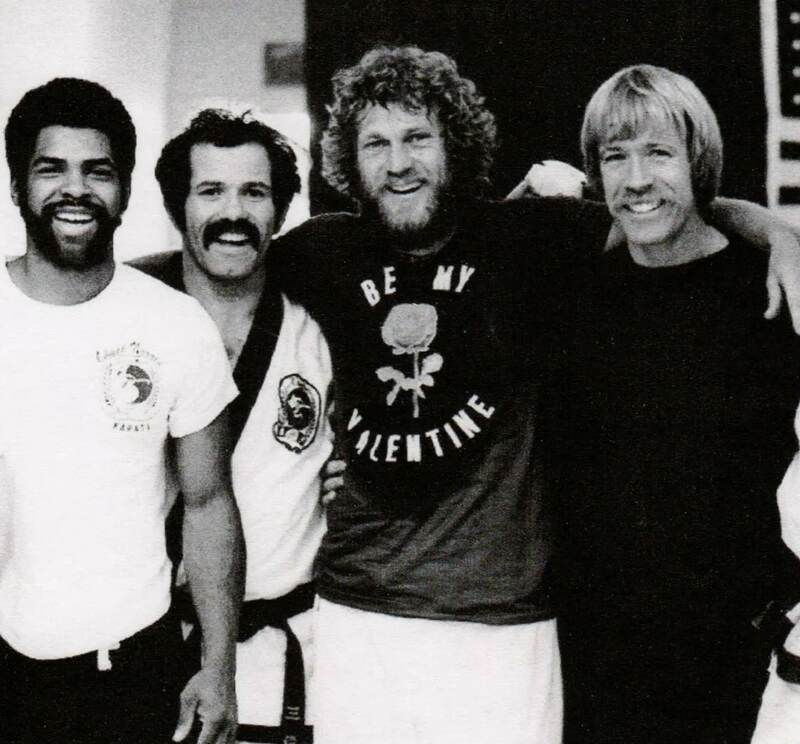 I interviewed Pat Johnson for this story (pictured above and below—second from left), who was a consultant on The Hunter and was also Steve McQueen's personal martial arts trainer, as well as his best friend and confidant. Pat is not only a 9th-degree black belt in American Tang Soo Do Karate but also performed stunts in The Hunter. Pat Johson met Steve McQueen back in 1972 when he was a martial arts instructor in the Korean based art of Tang Soo Do. Pat trained a lot of celebrities and was pals with Bruce Lee and Chuck Norris. As a matter of fact, Pat was in the first blockbuster Bruce Lee movie titled, Enter The Dragon. He was also in The Karate Kid, and Mortal Combat. Pat was close friends with both Steve McQueen and Loren Janes, and he told me he thought Loren Janes was the best stuntman he ever worked with. Pat shared a very emotional story with me about the last time he saw Steve McQueen just before Steve passed away. He said, "Steve and I were the best of friends. The last time I saw him was just before he passed away. In the hospital, I put my arms around Steve and said, 'I love you'. Steve kissed me on the cheek and said, 'I love you too." This is not the first Rolex to go through hell and back, that kept going. Rolex professional watches have been worn on the longest moonwalk in history, attached on the outside of a submersible that dove to the deepest known part of earth's ocean, and was on the wrists of the first team of explorers to fly over, as well as to conquer Mount Everest on foot. 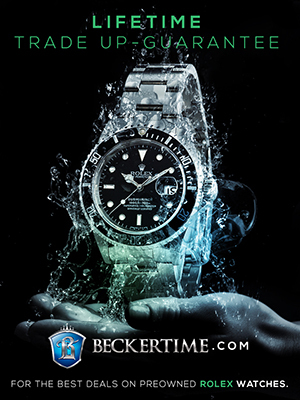 Rolex is no stranger to surviving extreme conditions. My first Loren Janes Submariner story published on June 5, 2018, created a tremendous amount of unintentional controversy, which resulted in an extremely confusing ending that left many, many unanswered questions. Thus, I am writing this story to clarify the real facts as best as I am able by putting forth the best evidence in this case. First I am going to give you some background on this story, then I am going to present the facts of this story as they unfolded for me in chronological order. As the self-proclaimed 'World's Leading Rolex Historian", I tend to be a big-mouth 'know-it-all' that is almost always sharing my opinion about everything Rolex, but in this story, I intend to do the opposite. Instead, I will simply share all the facts of my in-depth investigation into separating-the-fact-from- the-fiction, and let you, the reader, decide what you believe for yourself. In other words, I will remain impartial and neutral. This is not easy for me as I tend, probably, like most people, to be judgemental. Researching this story has taught me patience and NOT to jump to conclusions. If I had been judgemental in the early and middle phases of this investigation I would not have ended up being able to share many of the important facts of this case with you. Eleven years ago, when I started publishing Jake's Rolex World my goal was to capture all historically significant Rolex stories. 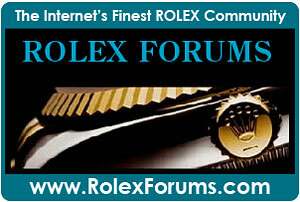 At the time there were many myths about Rolex history, many of which had been falsely perpetuated. 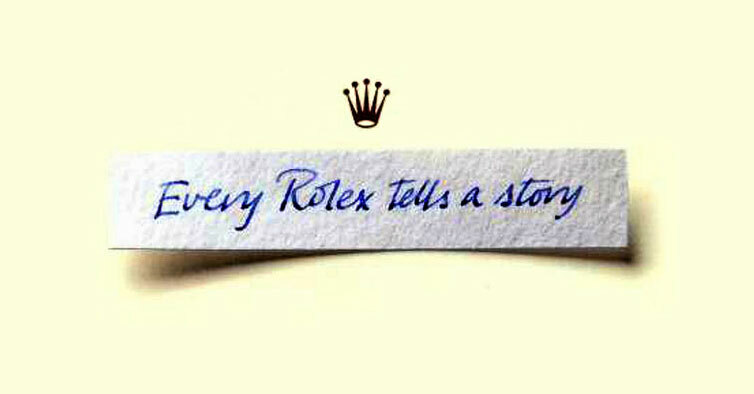 Over the years I systematically and methodically busted and debunked every single falsely perpetuated Rolex myth. Why did I bust all these myths? 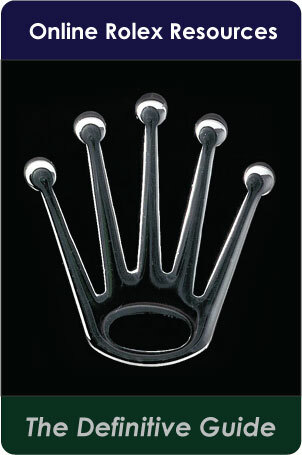 I understood Rolex's history was second to none and required zero exaggeration or embellishment to remain fascinating. 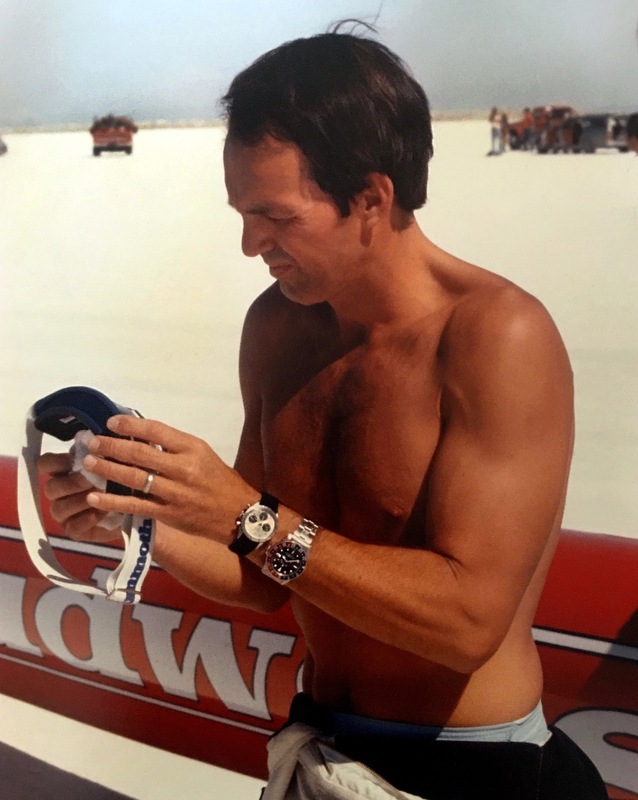 Over the same years, I also researched and published many definitive Rolex history stories, including my Profiles In Coolness series which included The Complete History of The Paul Newman Daytona, as well as The Complete History of The Steve McQueen Submariner. When Paul Newman's Daytona first came up for auction, I went crazy writing about it. 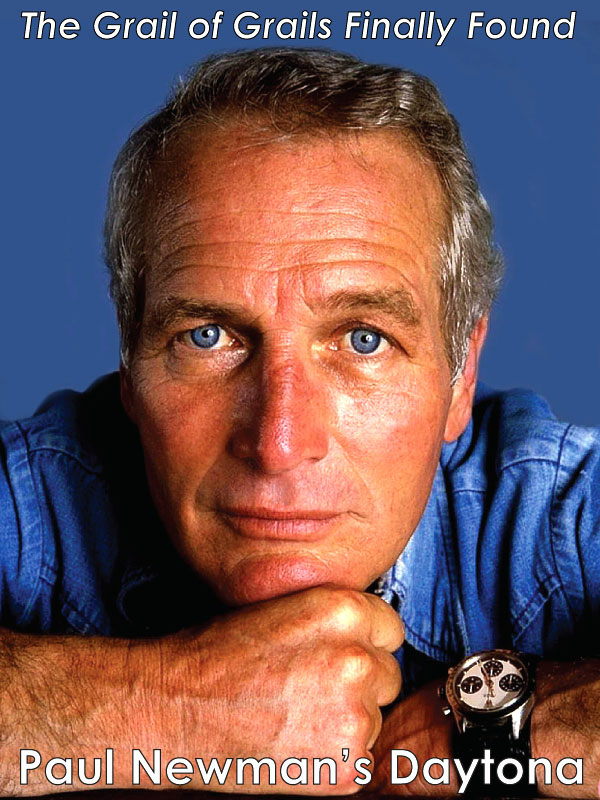 I did so as I knew Paul Newman was a high-priest of Rolex Daytona fandom, as well as being one of the most iconic Rolex wearers. 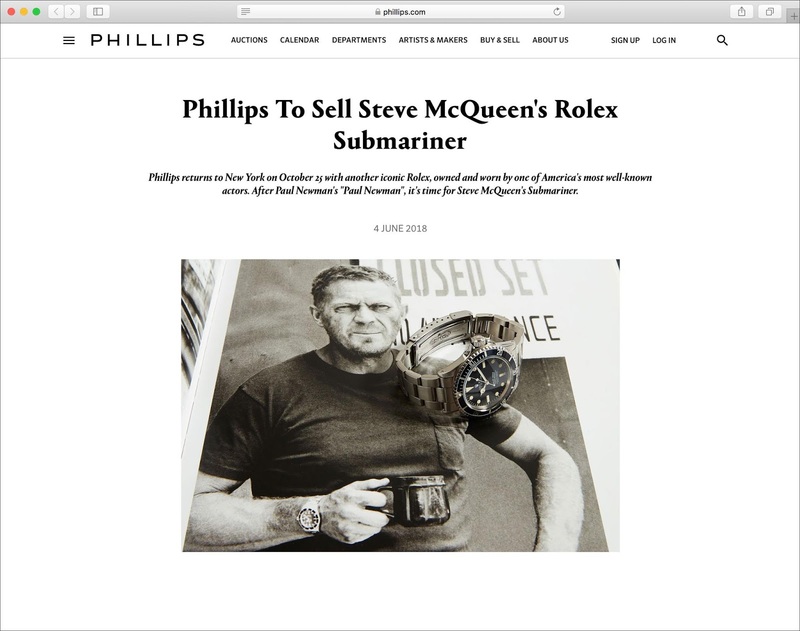 So, two weeks ago, when I discovered a story on Hodinkee.com titled, "BREAKING NEWS-Phillips To Auction Steve McQueen's Rolex Submariner Ref. 5513", I was naturally and equally fascinated. I also discovered a Forbes.com story titled "Exclusive: The Secret History of Steve McQueen's Rolex Submariner", which I also read in amazement! "Phillips returns to New York on October 25 with another iconic Rolex, owned and worn by one of America's most well-known actors. After Paul Newman's "Paul Newman", it's time for Steve McQueen's Submariner." I must admit I found it to be strange that I was reading all these stories from other online sources when I was the one who largely discovered and documented the story of Steve McQueen and his Submariner. I later realized I was the odd-man-out as I was the only one not on Phillips Auction house press release email list. As I read all the stories on the web I noticed glaring omissions, deep confusion, and inconsistencies in the narrative being put forth, but nonetheless, I was really excited, so I wrote a highly celebratory article about Loren Janes Rolex Submariner coming to auction based upon what I was initially able to report on. Just after I hit the publish button, I called my good pal, Stan Barrett on the phone. In my opinion, Stan Barrett is the living embodiment and personification of Rolex. In other words, if a Rolex professional watch was a man, it would be Stan Barrett. 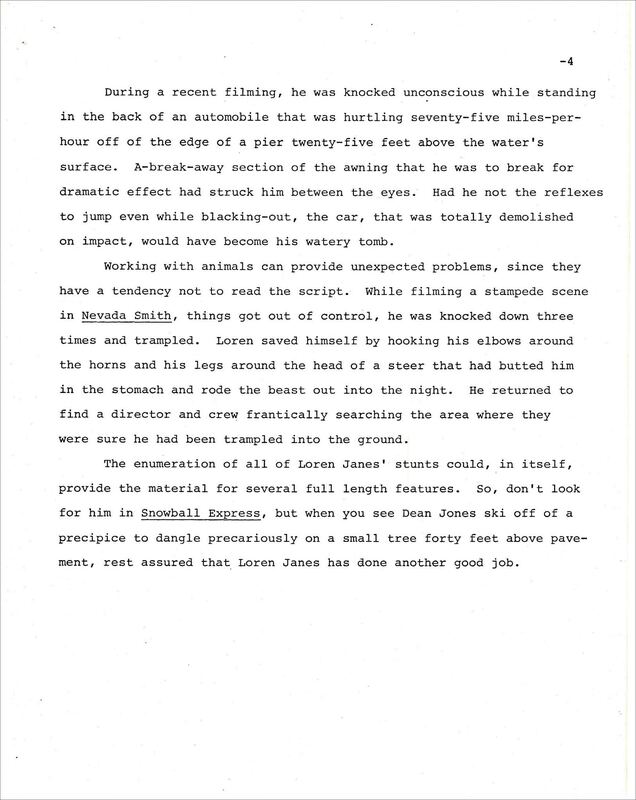 Among many career achievements in Stan's life, he was one of the top Hollywood Stuntmen, so I figured he would know Loren Janes. I called Stan and he answered the phone. I asked Stan: "Did you know Loren Janes? ", to which he responded with one word: "Submariner!" Stan and I tend to speak in Rolex parlance so this did not seem unusual to me. I mentioned I had just published a story about how Loren Janes Submariner that was a gift from Steve McQueen was coming to auction. Before I go any further in this story, it is very important for me to offer you more background on Stan Barrett. Stan Barrett was Paul Newman's stunt double and they were best friends until Paul passed away. 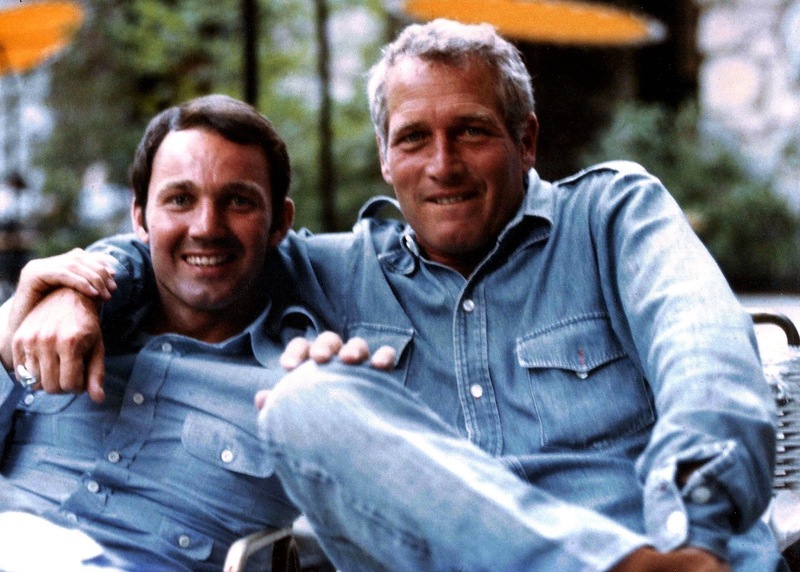 The photo above shows Stan Barrett and Paul Newman hanging-out in 1975. 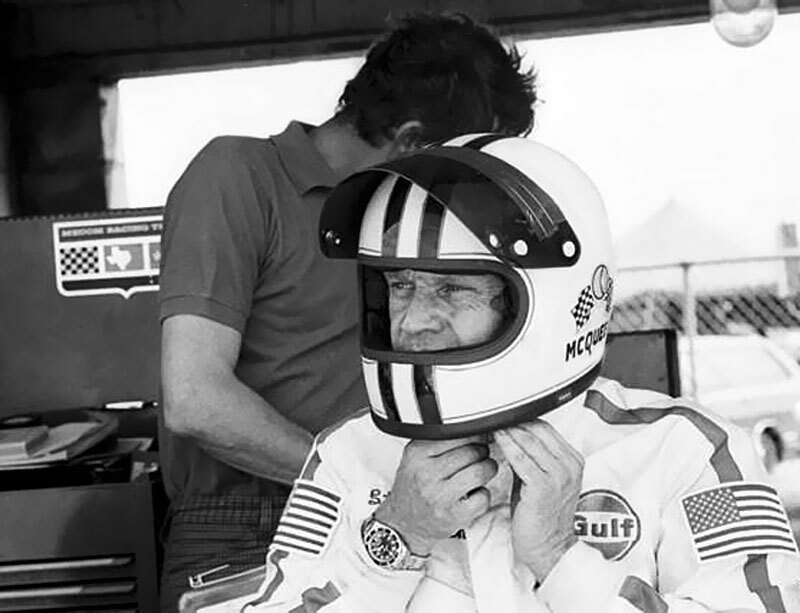 Stan Barrett was also a land speed king who broke one land speed record after another until he became the first man to shatter the sound barrier in 1979 in his Budweiser Rocket Car. 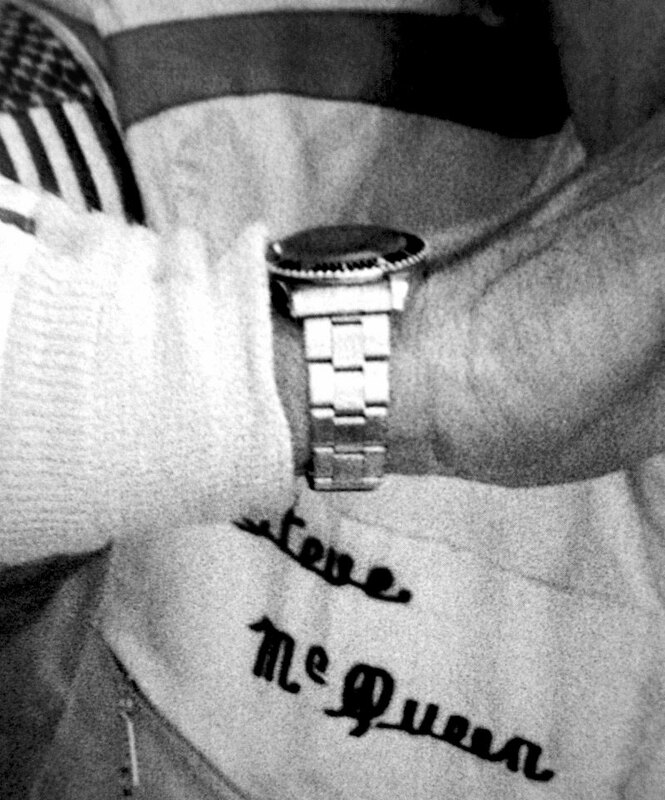 Paul Newman gave Stan Barrett two Rolex watches as gifts and we see them in the picture below on Stan Barrett's wrist just before he drove into the history books with a Paul Newman Daytona that Paul Newman gave him, as well as a Pepsi GMT-Master Paul also gave him. "To Stan Barrett. Undisputed Holder Of The Biggest Pair. Mach One—Edwards AFB. 17 Dec 1979." "LOREN, THE BEST DAMN STUNTMAN IN THE WORLD. —STEVE." Stan Barrett responded, "that doesn't sound right to me. I remember Loren's Submariner but I don't recall it having an engraving on the back from Steve McQueen." Then Stan laughed and said, "The best damn stuntman in the world—not even close!?!!" I responded and said, "Loren Janes filmography would suggest otherwise. You should see the provenance letter that accompanies the watch. It's amazing!" Then I asked Stan if I could read it to him. 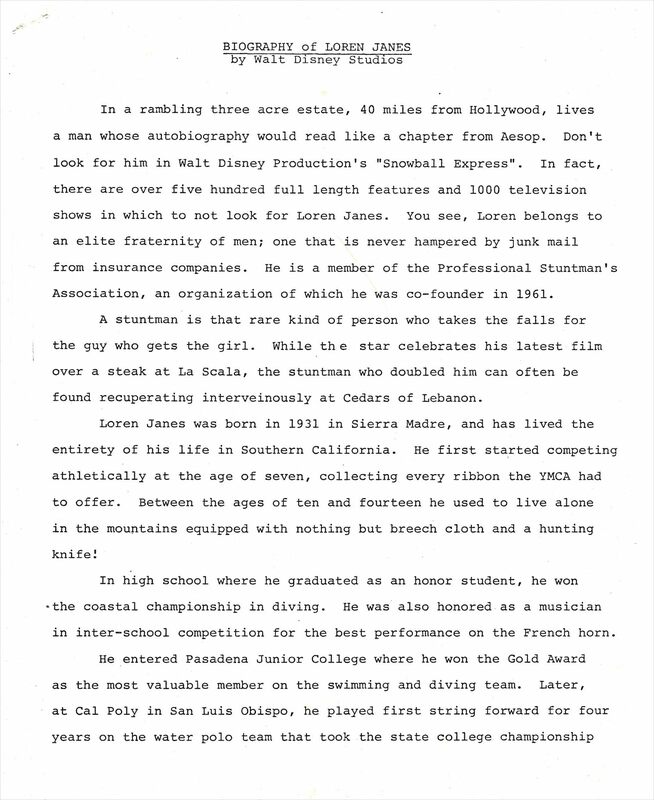 As I began reading the Loren Janes provenance letter seen below, Stan started ripping it to shreds. 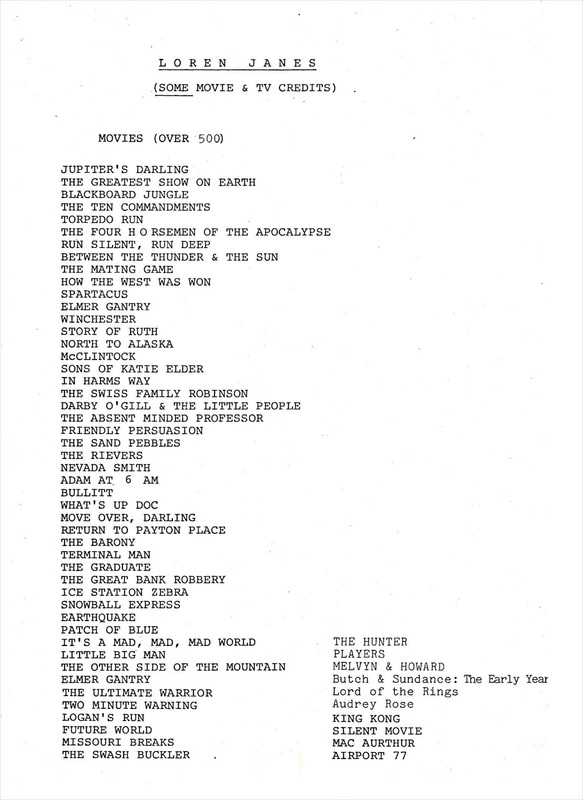 As I read the list of movies enumerated on the list, Stan kept interrupting me saying, "That incorrect!?!! Loren wasn't in that movie", "That incorrect!?!! Loren wasn't in that movie", "Again, Loren wasn't in that movie either!?!! Loren wasn't in that movie!?!!" Before I could even finish reading the letter, Stan said, "Look Jake. I know all the guys who were on those movies. I will put you in touch with every one of them, and you can ask them for yourself, and you will learn it is all incorrect. Loren had a habit of taking liberties with the truth, and I am telling you, that provenance letter is one big bucket of deception." I was devastated to hear Stan talk like this, but I trusted Stan 1000% and knew he had an encyclopedic memory. Stan started rattling off names and phone numbers and briefed me on the background for each person to call, and I did just that. 1. The letter was printed on what appeared to be an 8.5 x 11 piece of stationary and was signed by Loren Janes. From my preliminary research, I had discovered Loren Janes apparently wrote and signed that letter seven months after his home, with all his worldly possessions, had burned to the ground. Also, it was signed four months before he passed away at age 85. I was also aware that Loren was suffering from dementia in the advanced stages of Alzheimer's disease. So I thought to myself, this seems very fishy and makes little sense, that an 85-year-old man, suffering from Alzheimer's, who had just lost everything he owned in a catastrophic fire went out and had custom stationery made and wrote this letter. 2. 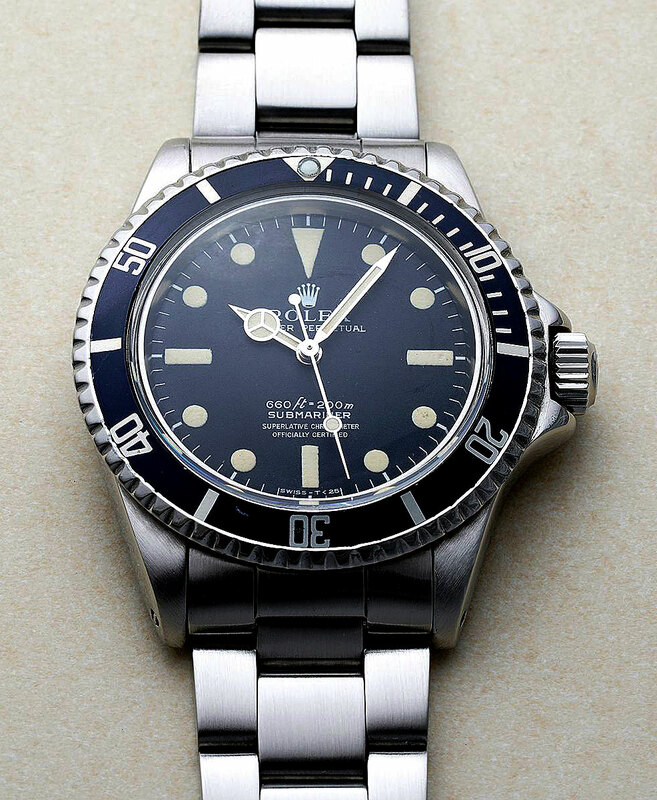 Timeframe Mismatch: Over the past eleven years I had spent way more time than anybody else researching and documenting Steve McQueen's Rolex Submariner, thus it occurred to me there were several inconsistencies in the letter having to do with timeframe and chain of ownership evidence. The letter began, "This letter accompanies Steve McQueen's Rolex Oyster Perpetual Submariner (Model 5513, Serial #1161771)...". Also, the last sentence in the first paragraph began, "Steve presented his watch to me..."
Also, the Phillips Press release, and Forbes.com article, as well as the Hodinkee piece all supported the notion that it was Steve McQueen's watch, that he owned and 'wore'. All this strange language seemed detailed but vague. 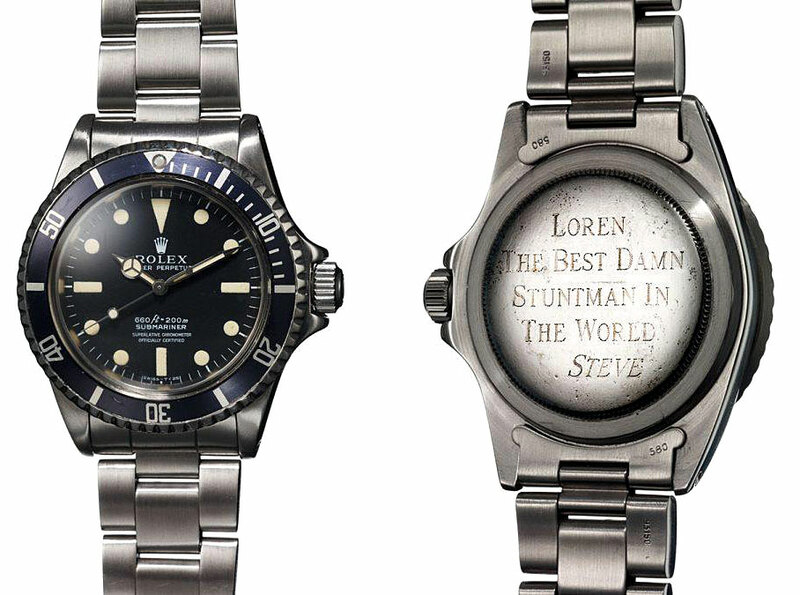 It made it seem like Steve owned and wore the Submariner in controversy, then took it off one day and gave it to Loren Janes, but then I thought if that was the case, then how did the engraving get on the back? When I walked through the timeline as it was put forth, it seemed like the narrative being suggested Steve one day, took off his Rolex, gave it to Loren as a gift, and then at some point in the future asked for it back so he could have it engraved, then gave it back to Loren. This made no sense. 3. 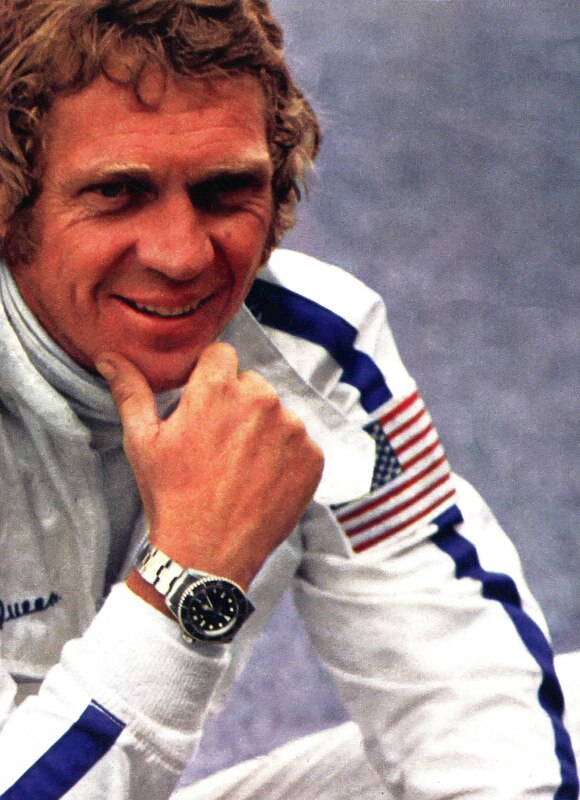 Second Timeframe Mismatch: The Phillips auction house press release narrative put forth an image of Steve McQueen supposedly wearing the same watch as seen below. In other words, the photo below shows Loren Janes Submariner sitting on top of a photo of Steve McQueen wearing the supposed same watch. This did not jibe with me for many reasons. 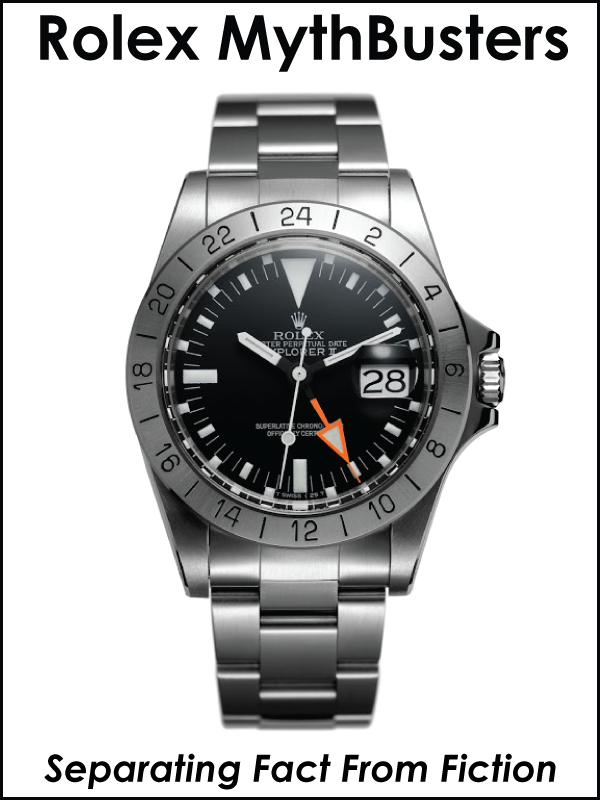 First, the narrative put forth said Steve McQueen gave Loren the watch in controversy in the early to mid-1970s. The photo below is the same photo Phillips used in their press release, but it is in color. It was taken on the set of Pappilon on April 18, 1973, by Ron Galella in Montego Bay, Jamaica. By the way, Stan Barrett doubled Steve in Jamacia. 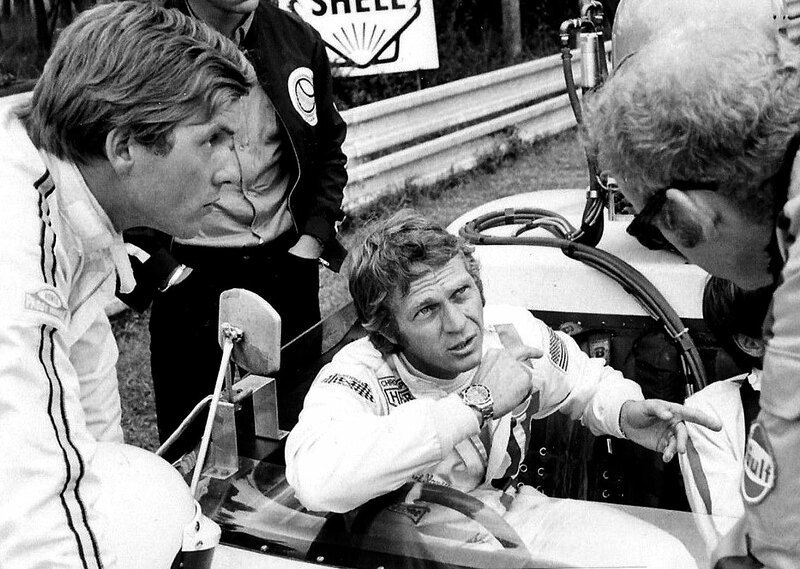 "I believe the first photo I have ever documented of Steve McQueen [seen below] wearing a Rolex Submariner was taken when he was racing during The 12 Hours of Sebring endurance race held at the Sebring International Raceway in Florida in 1970." This is a major point regarding the timeframe discrepancy for this story. 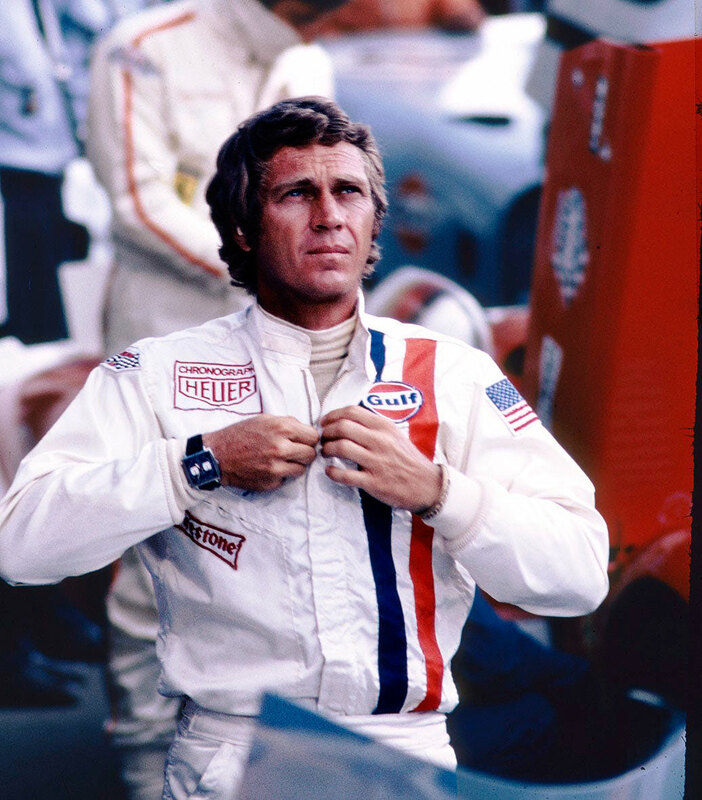 Steve McQueen pretty much exclusively wore his German-made Hanhart 417 Chronograph (pictured below) from 1962-1969 and did not wear any other sports watch until he showed up at Sebring in 1970 sporting his Submariner (pictured above). 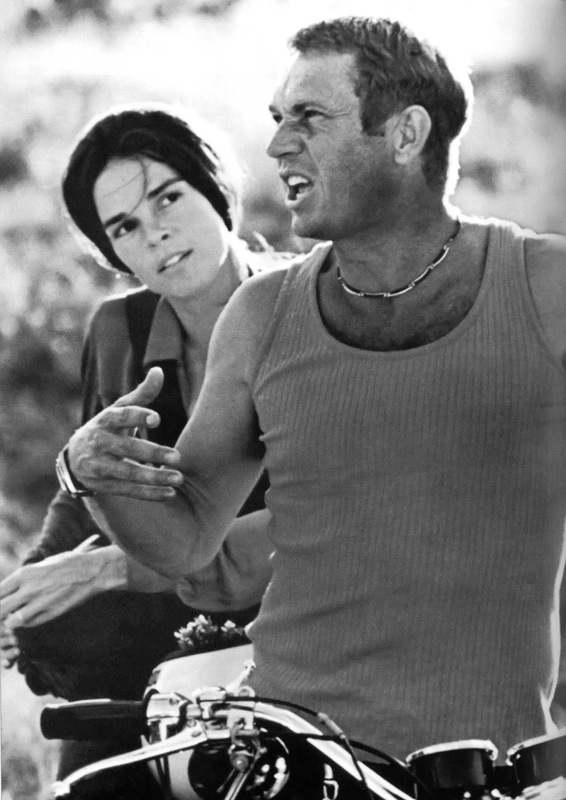 Steve McQueen is pictured below with his then-girlfriend, Ali McGraw on his motorcycle. I believe this photo was taken sometime around 1972-1973, and we see him wearing his Rolex Submariner. "I remember seeing him across the swimming pool and my knees were knocking. He radiated such macho energy!!! Men wanted to be like him. Uptight society ladies and biker molls wanted to be with him." "When the filming of "Bullitt" ended, McQueen offered Mr. Janes one of the three tricked-out Mustangs used in the film. Mr. Janes passed, fearful he would always want to drive it too fast. "Besides, I already had this," he said, removing a 1964 Rolex Submariner from his wrist. On the back was an inscription: "To the best damn stuntman in the world. Steve." So wait a minute!?!! 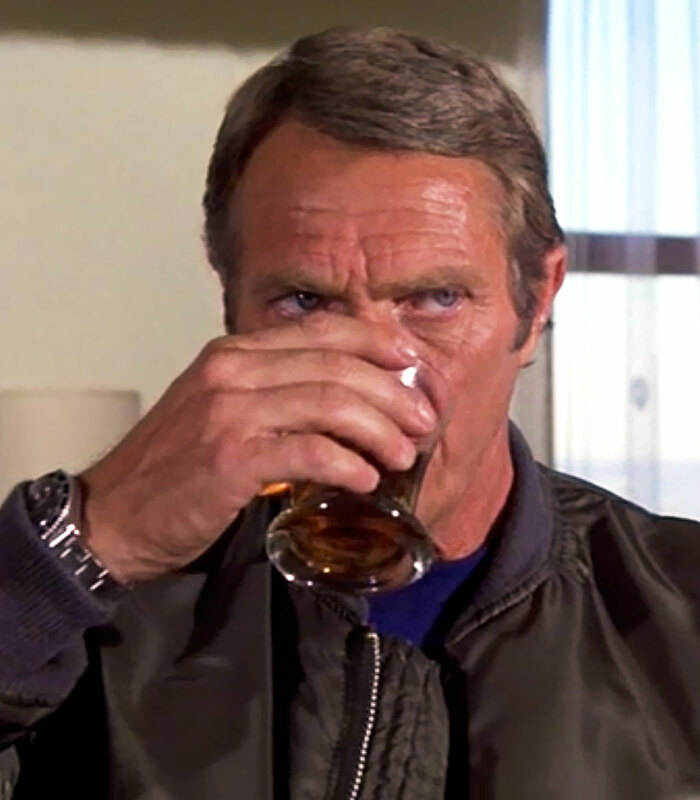 If Loren Janes said Steve McQueen had already given him a 1964 Rolex Submariner that he was wearing on the set of Bullitt which was shot in 1968, how could it be the same Submariner in the photo of Steve McQueen wearing it in 1973 on the set of Pappilon!?!!! This timeframe was completely antithetical and made no sense at all. After carefully studying the same Wall Street Journal article I noticed it was also riddled with many other inconsistencies that made no sense. At the very top of Taylor and Vallejo streets here on Sunday morning, I stopped to take in the view. Idling in a 2011 Ford Mustang V6, I looked down through the windshield at the impossibly steep hill below, immortalized in the 1968 film "Bullitt" starring Steve McQueen. Seated next to me was Loren Janes, 79, McQueen's longtime stunt double and the last surviving member of the "Bullitt" car crew. Mr. Janes drove the green Mustang in the movie's most daring and riveting scenes—the one down Taylor Street and the other along Guadalupe Canyon Parkway. I even brought along a CD of the "Bullitt" soundtrack for the ride. Two weeks after the death of "Bullitt" director Peter Yates, Mr. Janes and I set out to honor him by driving the movie's chase route—cautiously. "Peter wanted everything about the chase to feel risky and rough," said Mr. Janes, whose stuntman credits include more than 500 movies and 2,100 TV episodes. "Peter never got cold feet about any of the stunts that coordinator Carey Loftin lined up. He knew that a memorable film needed to be on the edge." "Bullitt" still ranks high among car-chase enthusiasts. Several websites are devoted to information and trivia about the 10-minute chase sequence. Others have posted "then and now" images of chase locations. In fact, fans can even retrace the routes thanks to an online Google map that a fellow afficionado has marked up. On YouTube, the "Bullitt" chase remains chilling. The green Mustang and black Dodge Charger tear through urban residential neighborhoods, bouncing off hills like Hot Wheels cars and banging into each other along the way. Yates raised the stakes even further by placing cameras in the cars, creating a new genre in which the viewer becomes a queasy passenger. As Mr. Janes and I drove around the city, three myths were shattered. First, despite the hype, McQueen did not do his own driving in the movie's most dangerous scenes. 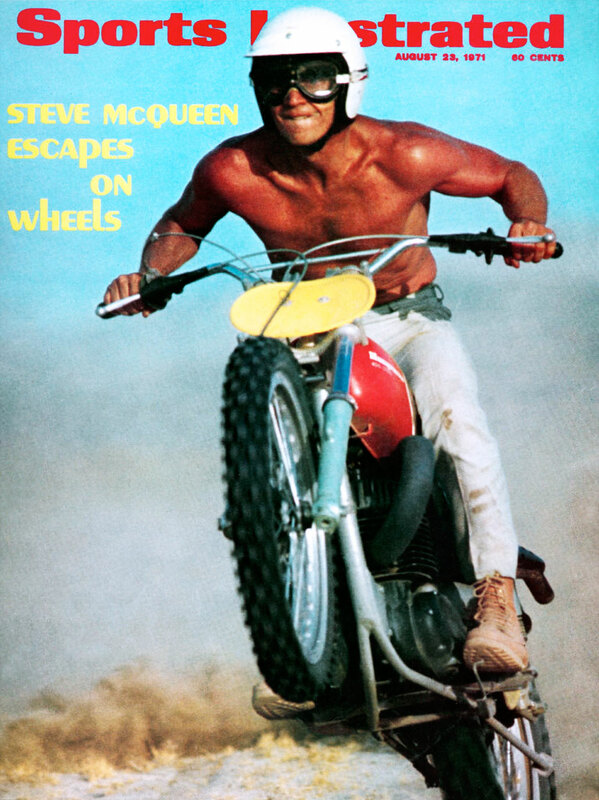 "Steve was a great driver, but he was only behind the wheel for about 10% of what you see on screen," said Mr. Janes, who was McQueen's stunt double from 1959 to 1980. "He drove in scenes that required closeups—but not in the ones that could kill him. Steve always asked me first whether a stunt was too dangerous for him to take on." The second revelation was that Mr. Janes was the stuntman who hurtled down Taylor Street in the Mustang and repeatedly sideswiped the Charger on the Guadalupe Canyon Parkway at 90 miles per hour. For years, Bud Ekins was assumed to have been that driver. "I was working on another film at the time, so Bud drove the early scenes before I arrived on the set," Mr. Janes said. "Many assumed he had driven them all, which wasn't the case." And the third revelation? The chase's most breathtaking driving scenes are terrifying in real life, even for someone who grew up in 1970s muscle cars. As we began to descend Taylor Street's first sheer hill, Mr. Janes offered a warning: "Don't even try going down here the way I did. Our cars were heavily modified with racing shocks, special overinflated tires and skid bars on the underside. A factory car would come apart on impact if you sent it into the air here." Point well taken. The pitched angle and approaching stop sign at Green Street forced me to inch down the hill's first leg at 15 mph. In the film, Mr. Janes hurtled down these hills at 60 mph in pursuit of the Charger, using each level intersection as an asphalt ski jump. "Traffic was cleared for us then," Mr. Janes noted. "We didn't have to worry about trucks and pedestrians—the way you do." Fine, but how did he send the Mustang into the air? "I gunned the engine just as the back wheels leveled off at the cross streets," Mr. Janes said, not noticing that I had rolled gingerly through the stop sign to gain momentum. As my rear wheels leveled off at the intersection, I hit the gas moderately. The Mustang surged forward, and I could feel the car trying to take flight where the flat surface ended abruptly and the hill resumed. "Feel it?" Mr. Janes asked coolly. "Any faster, though, and this car will take off, leaving the underside damaged when we come down." At Union Street, the next intersection, I gunned the engine lightly again. This time the Mustang lifted a little more and settled back down harder. I asked Mr. Janes how he managed to avoid being tossed around in the cockpit like a marble. "When I left the hill, I pushed back into my seat using the wheel. That held me stable," he said. In the movie, the Taylor Street sequence ends with the Charger hooking a hard left on Filbert Street and the Mustang following. As we near Filbert, I asked Mr. Janes how he made the turn while traveling so fast. "I started turning the wheel about three-quarters of the way down and fishtailed off to the right," he said. "Otherwise I would have overshot the turn or flipped." Born in Sierra Madre, Calif,, Mr. Janes was a high-school calculus teacher when he was discovered by one of his students, whose father worked at MGM. The student knew Mr. Janes was a gymnast, former Marine and skilled swimmer. He suggested that Mr. Janes offer his skills for a 90-foot stunt dive off a cliff on Catalina Island for an Esther Williams film. Mr. Janes's stunt career was launched with that perfect dive in 1954. In 1959, Mr. Janes met McQueen on the set of TV's "Wanted Dead or Alive." 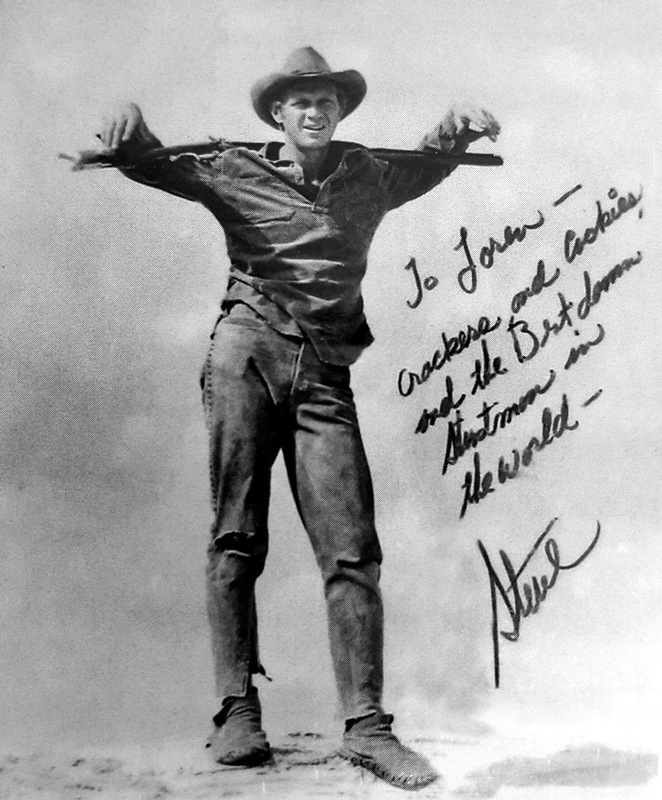 His first stunt as the actor's double required him to dive through a barn window, roll to his feet, vault over two horses, land on McQueen's animal and ride off. "It went flawlessly," Mr. Janes said. "From then on, Steve wanted me on all of his pictures." After driving down Taylor Street, Mr. Janes and I toured the other chase locations. In the Mission section, we re-created McQueen's U-turn and zoom up York Street. Next came Potrero Hill, where the two cars tear down Kansas Street starting at 20th Street. I peeled out there. We even drove out to Guadalupe Canyon Parkway, about 20 minutes from San Francisco. In the movie, Mr. Janes sideswiped the side of the Charger multiple times in an attempt to drive it off the road. "Bill Hickman, the great stuntman, drove the Charger," he said. "Bill and I spent a long time working out those bangs in advance." When the filming of "Bullitt" ended, McQueen offered Mr. Janes one of the three tricked-out Mustangs used in the film. Mr. Janes passed, fearful he would always want to drive it too fast. "Besides, I already had this," he said, removing a 1964 Rolex Submariner from his wrist. 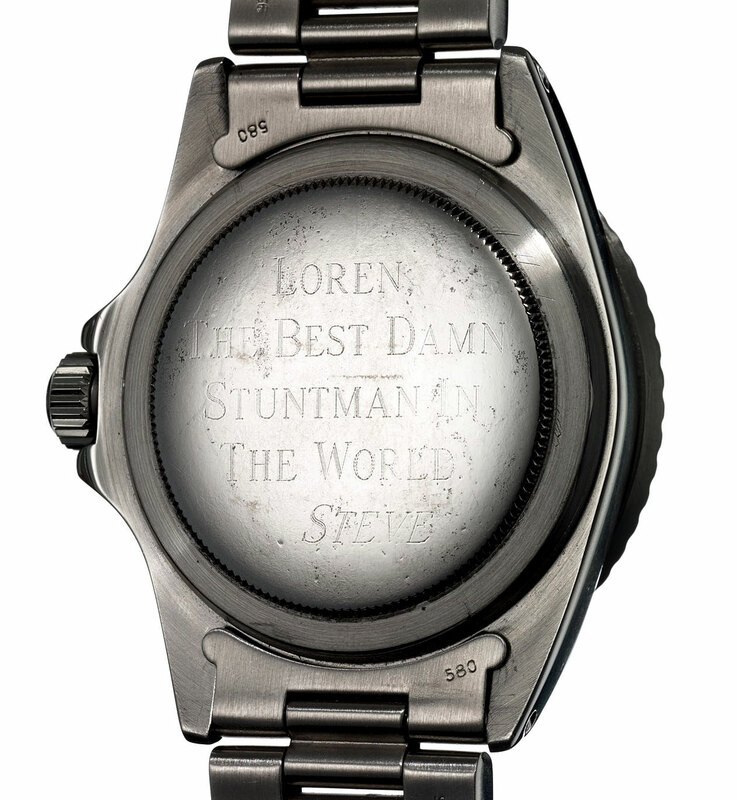 On the back was an inscription: "To the best damn stuntman in the world. Steve." "It was a well-known fact in the stunt community that Bill Hickman, Cary Loftin, and Bud Ekins were credited with doing the amazing car chase in Bullitt. As a matter of fact, Steve McQueen was an excellent driver and did a lot of the driving himself—so much so he almost got killed. I take huge exception for people who try to take credit for things they did not do, as it takes credit away from the people who actually deserve credit." A. Paul began by saying, "This Steve McQueen owned timepiece..." Once again, the timeframe did not jibe on this statement for the reasons put forth earlier in this article. B. Paul continues (@:14): "It was owned and worn by Steve McQueen himself, and given to his top stuntman, Loren Janes. They starred together in 19 different films out of the 26 films that Steve McQueen shot during his career." This seemed like an unusually high number of films for Loren to have done stunts in for Steve McQueen. I later confirmed this NOT to be true. C. Paul also said (@:34) "The watch without the McQueen provenance probably would have an estimate of $30,000 to $50,000." This estimate made no sense to me and seemed very high for a non-provenance watch. Especially since it has a 5512 dial on a 5513 model case. Also, the watch is missing its original gilt dial and riveted bracelet, which does not make sense. D. The Provenance binder shows photos from my Steve McQueen stories I have published over the years. 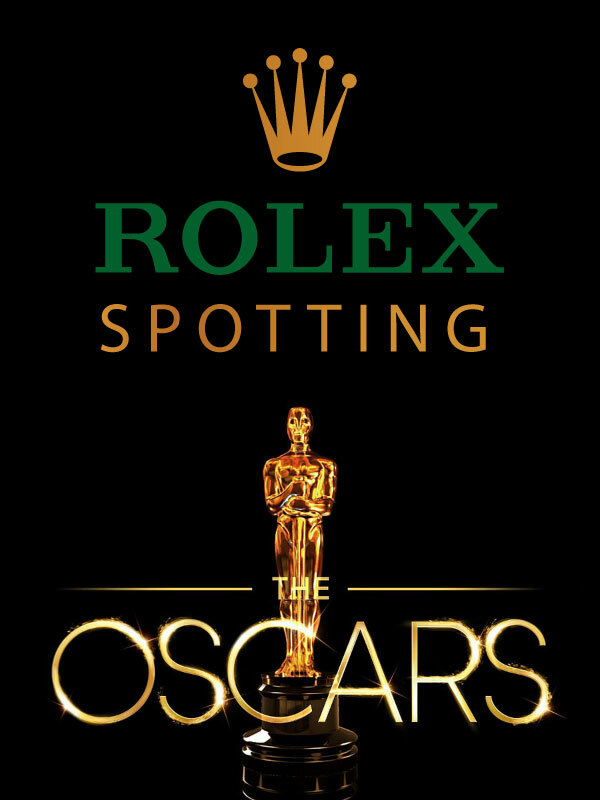 In particular, it shows the image below which was a mock-up I created for a 2013 Rolex ad competition story I published years ago. I don't know how this image ended up in the provenance, but I was surprised to see it. My first phone call was to Gary Combs, who was one of Hollywood's top stunt coordinators and stuntmen who doubled Steve McQueen. Gary Combs confirmed that the supposed provenance letter signed by Loren Janes was riddled with historical inaccuracies, and thus was likely NOT written by Loren Janes. 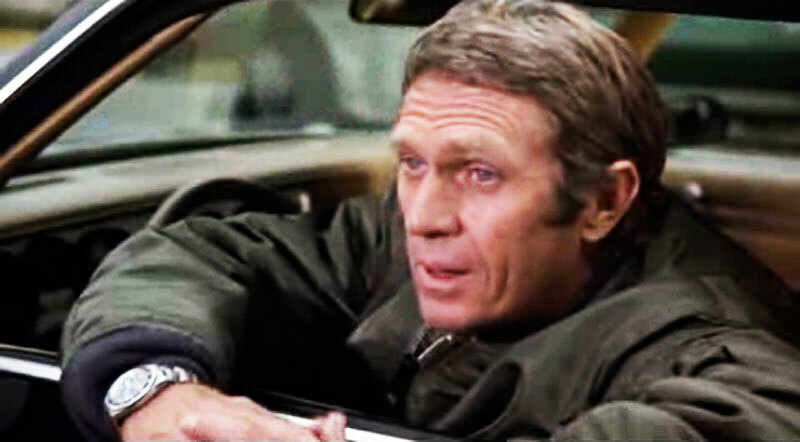 Gary Combs worked with Steve McQueen and Loren Janes on the major motion pictured titled, "The Hunter"
The photos above and below of Steve McQueen were from The Hunter, which was his last film, which prominently showcased his Rolex Submariner. Loren Janes doubled Steve McQueen on The Hunter as we see in the photo below where Loren and Steve look like twins. 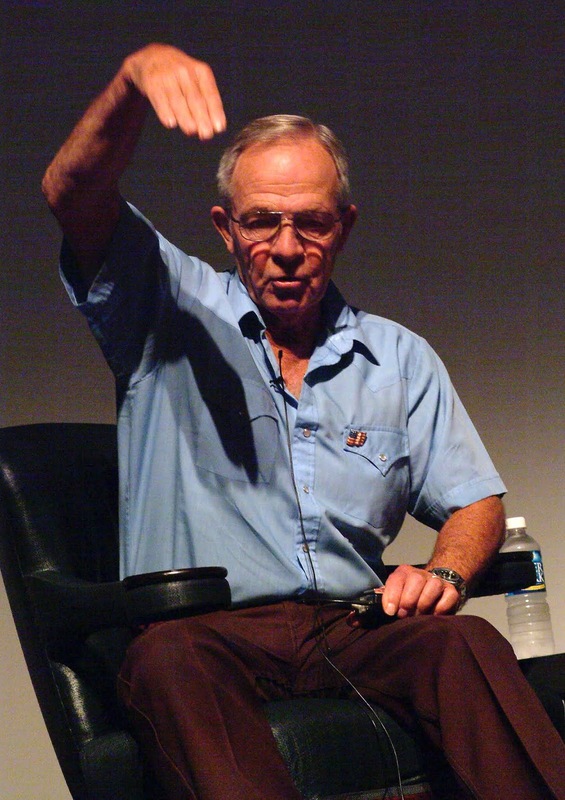 Gary Combs was chosen by the Director of The Hunter, Buzz Kulik to be the stunt coordinator and double Steve McQueen as his stuntman. 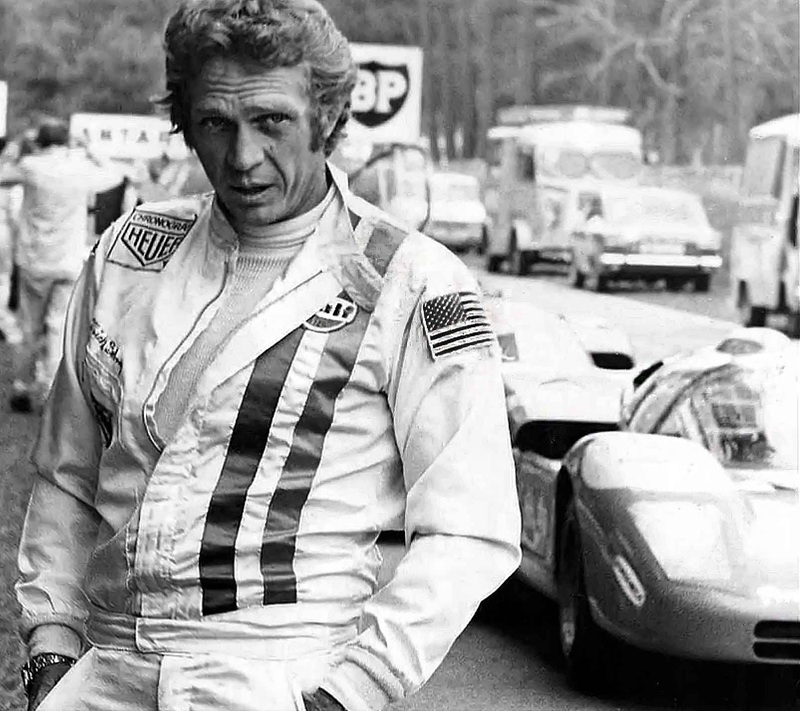 Steve McQueen spoke with Gary Combs before filming began and said, "Loren Janes hasn't doubled me for a long time, I would really like for him to double me in this movie." Gary Combs agreed, and Loren Janes doubled Steve McQueen. 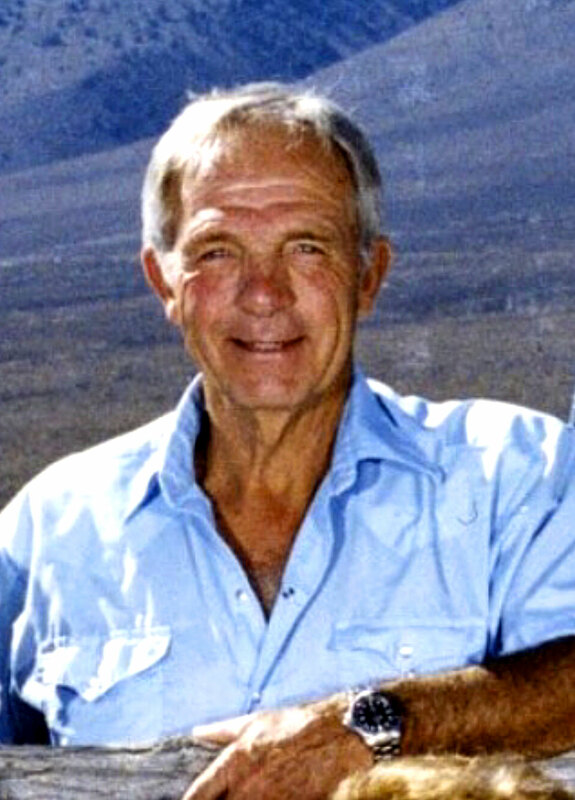 Gary Combs had doubled Steve McQueen in Steve's previous movie titled Tom Horn, which was a cowboy film. Gary was also the stunt coordinator and second unit director on Tom Horn. 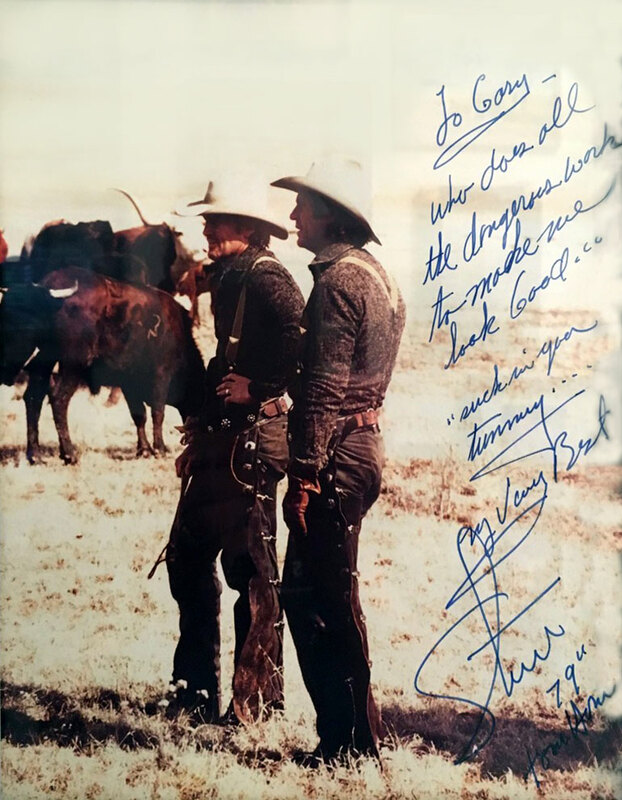 Gary shared the photo (taken by Barbara Minty) below that shows Gary Combs and Steve McQueen on the set of Tom Horn. I could not help but notice the handwritten message on the photo was remarkably similar to the one coming up later in the story that Steve McQueen wrote to Loren Janes. 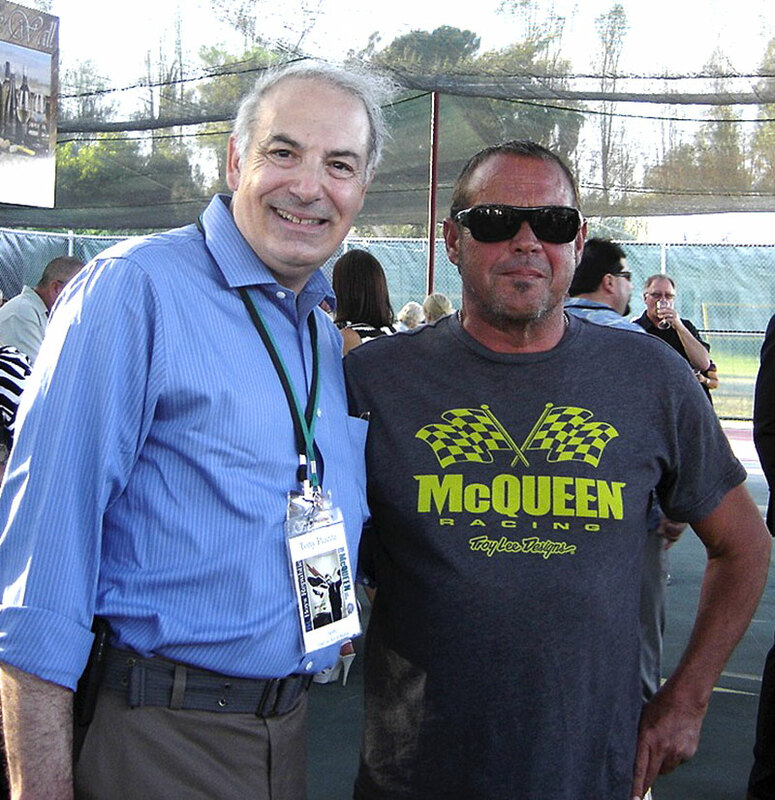 Next, I reached out to Chad McQueen, who is Steve McQueen's son for comment on the provenance behind Loren Janes watch. I also reached out to Aurel Bacs from Phillips for comment and ended up speaking with Paul Boutros who was very polite, professional and straightforward. Later I spoke with Don Nunley who was the property master on the Steve McQueen movie titled "Le Mans" which was filmed in 1970 and released in 1971. Don recently wrote a book with renowned Steve McQueen historian Marshall Terrill named "Steve McQueen, Le Mans in the Rearview Mirror." Don Nunley said Loren Janes was not involved in any way shape or form in Le Mans, and if anybody would know, it would be the Le Mans Property Master. Don was the second witness who told me that the provenance letter was incorrect. 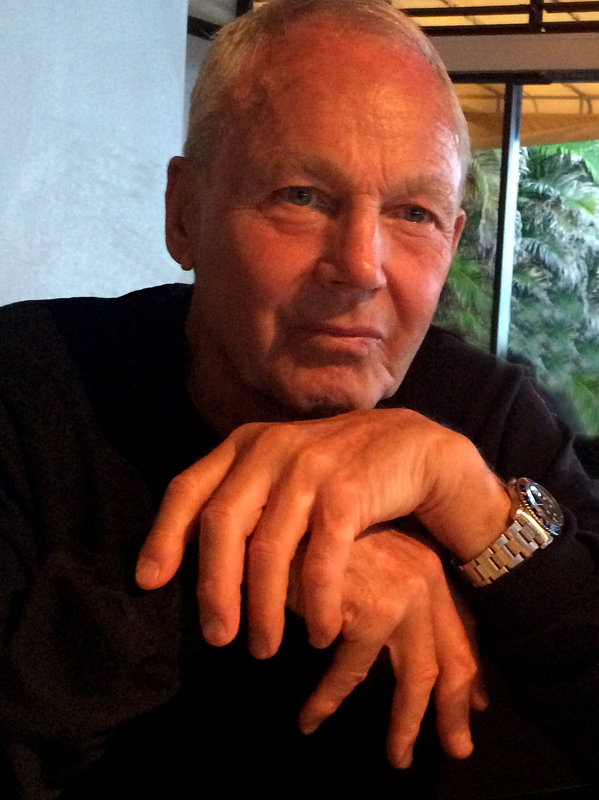 I spoke with Michael Eisenberg who is the current owner/consigner of the watch. Michael purchased the watch from Loren Janes daughter, Erika Janes. Michael is a very successful real estate agent in Beverly Hills, California as well as being a collector of Hollywood memorabilia. I asked Michael a zillion questions and he helped fill in many blanks in the story. I interviewed legendary stuntman Mickey Gilbert regarding this story. Mickey is the real deal and his IMDB Filmography is stunningly impressive. Mickey did a lot of stunt doubling for Robert Redford, including in Butch Cassidy & The Sundance Kid, as well as in the Horse Whisper. He also worked on Ben Hur, The Last Of The Mohicans, and Little Big Man. "Loren Janes wasn't there!?!! He had nothing whatsoever to do with the movie. Besides, Junior Bonner was a rodeo movie and Loren wasn't much of a horseman. I grew up on a ranch and competed in rodeos when I was a young man. It doesn't surprise me to learn this about Loren as he exaggerated a lot!" At the end of our superb conversation, Mickey thanked me for sharing this crazy story with him. He laughed and said, "This story is like a comedy sequence that's all lies." 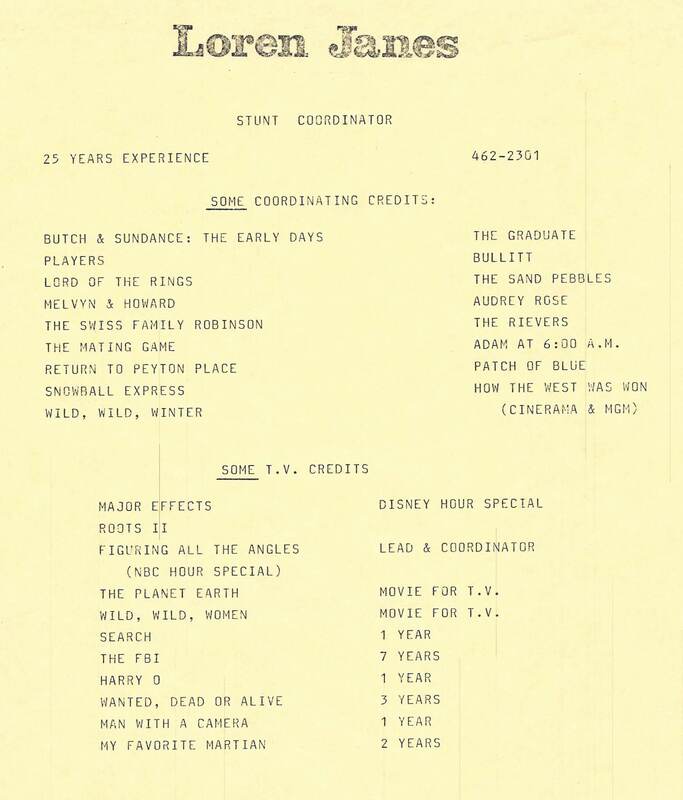 With the advent of Mickey's confirmation, that made four movies that Loren Janes provenance letter said he was in, but was not. I posted the graphic below from I Love Lucy, and suggested that Phillips Auction House had some splanin' to do. 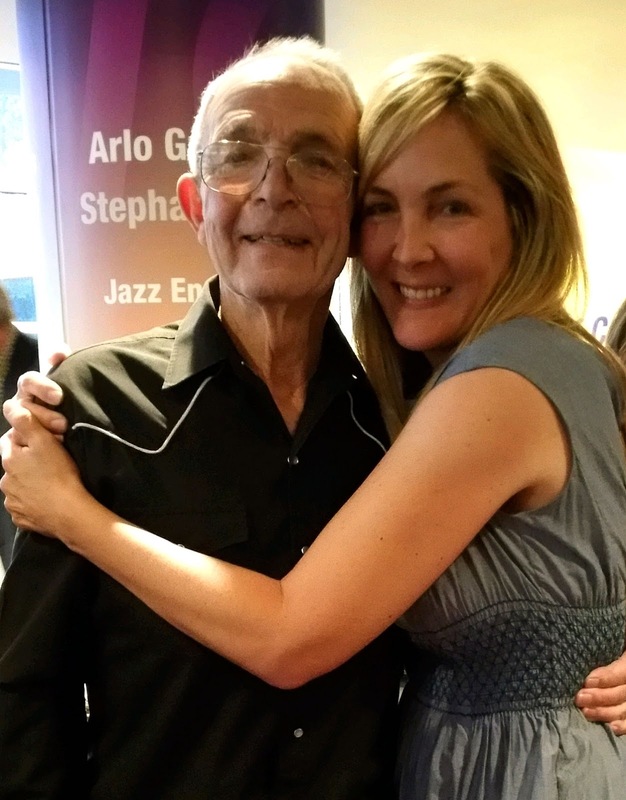 On the evening of June 8th, I interviewed Loren Janes daughter, Erika Janes. We spoke for several hours and she shared her entire story with me and I have to say I was stunned!!! 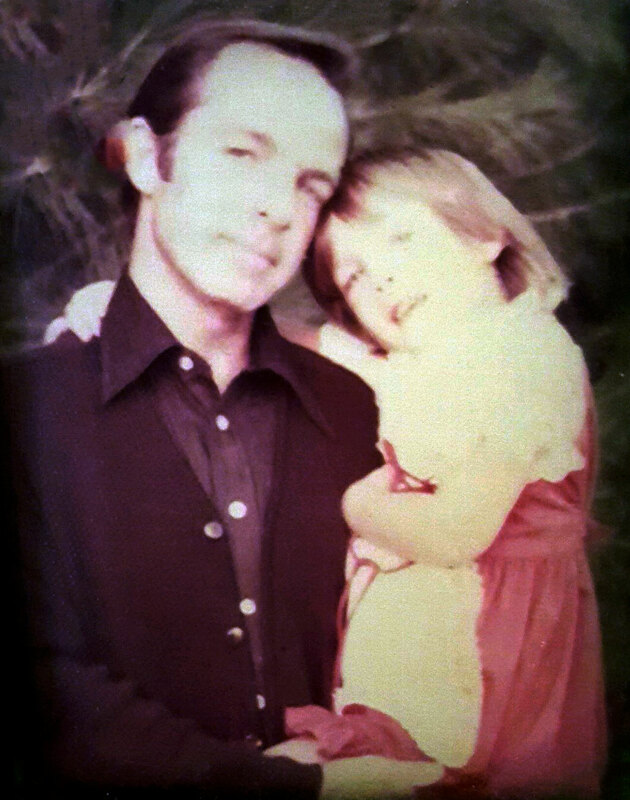 Erika is pictured below with her father, Loren Janes when she was 4 years old. In this next photo, we see Erika Janes hugging her dad Loren Janes on March 5, 2015. 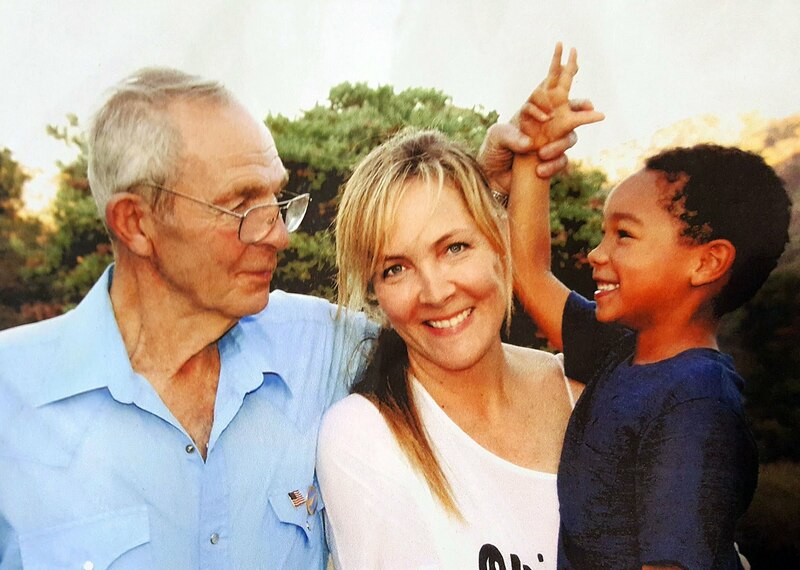 In this next photo, we see Loren Janes holding his grandson Braylon's hand with his daughter Erika between them. This photo was taken in 2016. Erika reached out to me after having read my story on her father's watch at which time I had attacked the provenance letter and ripped it to shreds. Erika said she wanted to talk to me to make some clarifications. The first thing we discussed was the provenance letter that Phillips presented. I told her that I confirmed the provenance letter was full of inconsistencies. Erika responded by asking, "What does provenance letter mean?" I told her a provenance letter stands testament to the origin or earliest known history of a watch, or any object." I asked Erika who wrote the provenance letter and she said, "I wrote it." I asked her why she listed all the movies her father was not in? She said, "When I wrote the letter I thought I was writing a letter for Michael Eisenberg, who was a famous watch collector. " "I listed movies I knew my dad was in with Steve McQueen that he always talked about while I was growing up, and I looked up the rest on the internet," I told Erika I had evidence her father was not in four of the movies. Erika responded, "I really screwed-up, didn't I?' I replied, and said, "No, not at all." She replied, "I didn't make a huge mistake?" I said, "No. It was an honest and innocent mistake. 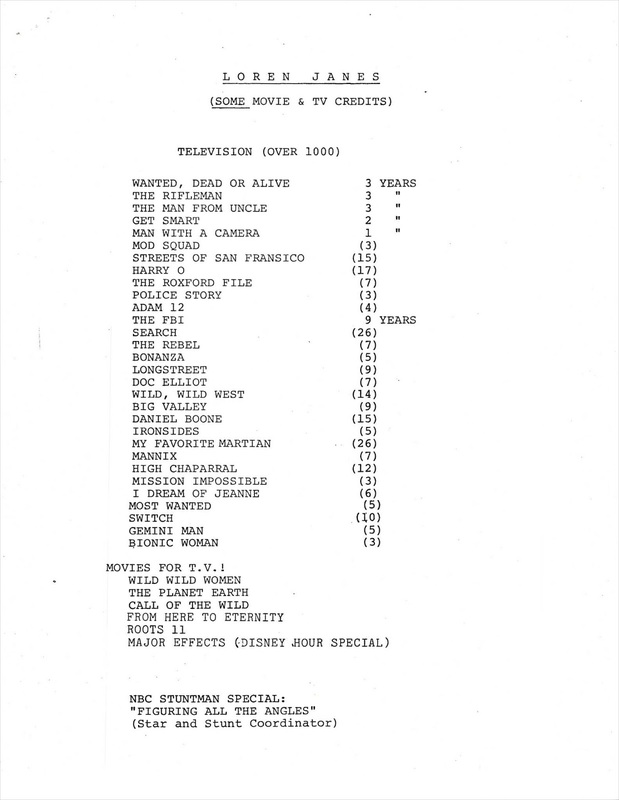 Anybody who went to visit Loren Janes IMDB page would have seen a number of movies he was being credited with that he was not in. BTW. We reached out to IMDB to learn who inaccurately updated Loren Janes record and have yet to hear back from IMBD. I intend to follow-up again with IMDB so we can get clarity on this issue. I told Erika, "All that matters now is that you are 100% honest with me so we can accurately set the record straight." I asked her how her 85-year-old father who was suffering from Altzheimers disease, whose home had burned down to the ground seven months prior destroying all his worldly possessions could have found time to purchase custom stationery. She told me she typed out the letter in the Pages Application on her MacBook. 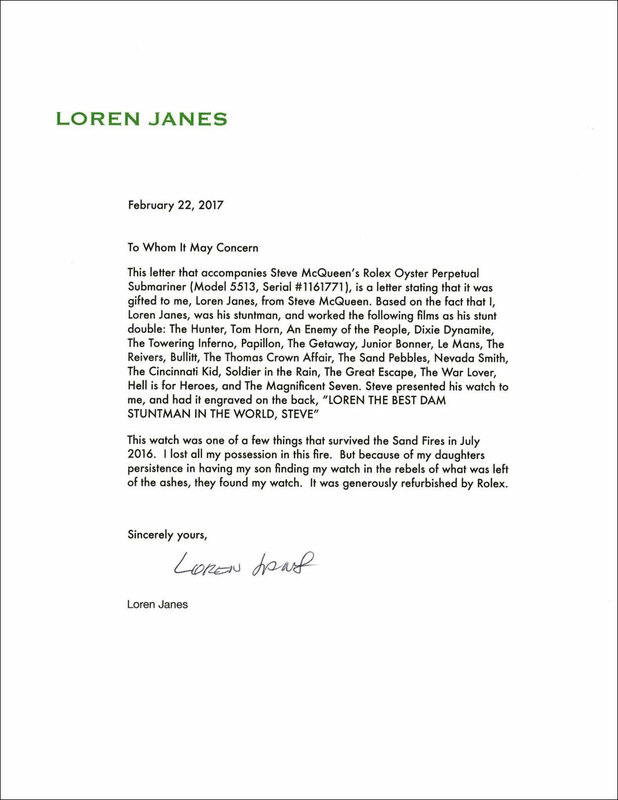 "This letter that accompanies 'Steve McQueen's Rolex Submariner' Oyster Perpetual Submariner (Model 5513, Serial #1161771), is a letter stating that it was gifted to me, Loren Janes, from Steve McQueen." 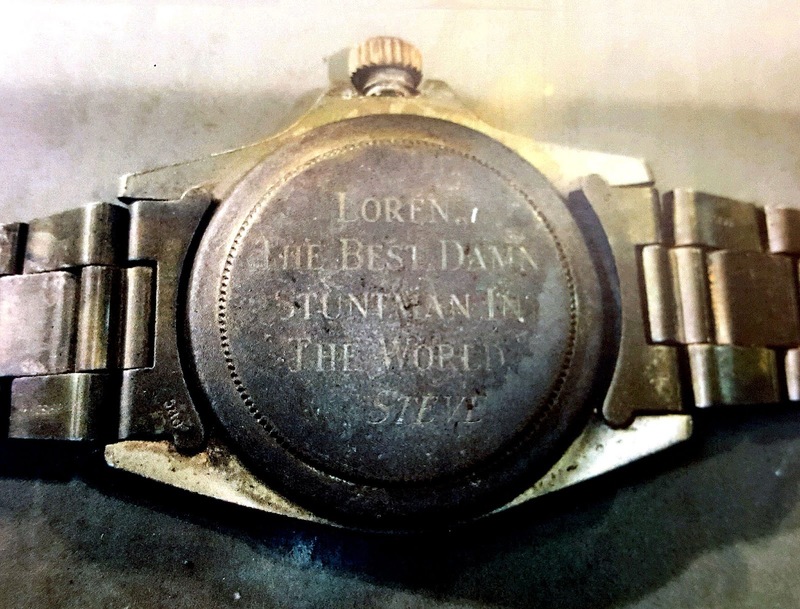 "Steve presented 'his' watch to me and had it engraved on the back, "LOREN THE BEST DAM STUNTMAN IN THE WORLD STEVE." I told Erika that this language was really confusing and made it sound like Steve McQueen took the Submariner off his wrist and gave it to her father, which did not make sense. If that was the case, how did the engraving end up on the back? Did Steve give him the watch, then ask for it back later so he could engrave it, then gave it back to her dad? Erika said, "I wrote that provenance letter because Michael asked me to memorialize the history of the watch. I was really overwhelmed at the time with helping my father after the fire and I had no reason to believe the filmography information I found on my dad on the internet was incorrect." "I am not a good writer, and I also have dyslexia, so sometimes I write stuff backward or stuff that does not make sense to other people." This is true as there were some strange spelling errors, like using the word 'rebels' in place of 'rubble'. Erika also told me the story of how her brother Eric Janes had dug through the rubble after the fire to find their dads Rolex. "When I was 11 years old, I remember being in my dad's closet checking out his stuff. My dad had a special shelf where he kept his Rolex when he wasn't wearing it. I picked it up and was playing with it—putting it on my wrist and looking at it. 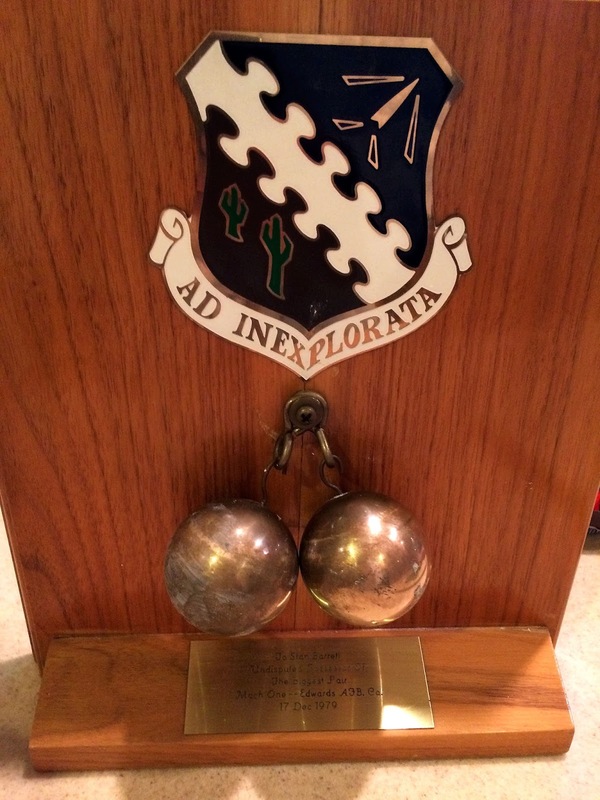 Then I turned it around and noticed it has an inscription that was signed, "STEVE". I remember thinking to myself, 'Oh, this is from 'Uncle Steve.' After all, Steve McQueen was like an uncle to me. I remember many times when he and dad were hanging out together, and to me, he was just Uncle Steve." "I want to talk with Stan about what he said. I understand he saw my dad differently than I did, but I was disappointed to read what he said. My dad loved and looked up to Stan Barrett. As a matter of fact, when I was 11 years old my dad took me to watch Stan Barrett in his rocket car when Stan broke the speed of sound barrier. It as a really big deal and my father and I prayed with Stan's family just before his final run when he shattered the sound barrier." At the end of our interview, I asked Erika to please reach out to anybody and everybody she knew to find people who could confirm that indeed the watch was a gift from Steve McQueen to her father. She agreed to try and do so. Erika had reached out to a bunch of people who knew her father well, and the evidence blew my mind!!! 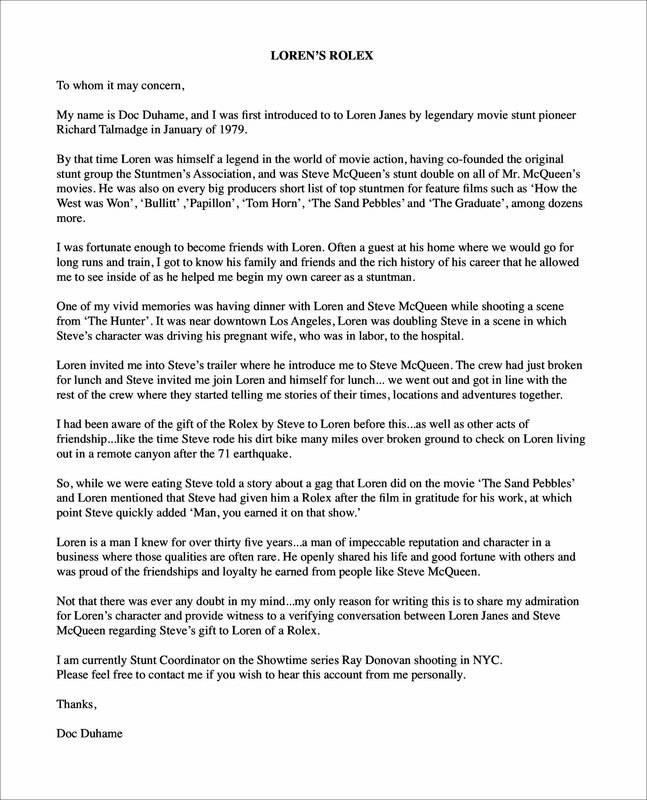 First I received the letter below from Doc Duhame, in which he confirmed he had a conversation with Steve McQueen and Loren Janes in which Steve McQueen confirmed he had given Loren the Rolex Submariner is controversy. 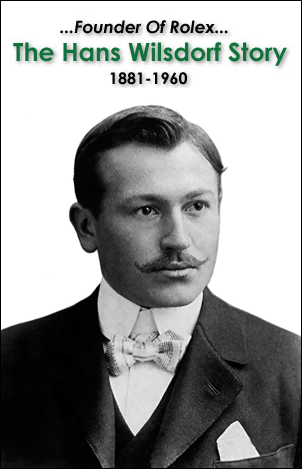 I interviewed Doc Duhame for a few hours after I had read his letter seen above. I found him to be an extremely credible and honest witness. Later that day I received the statement seen below from Marshall Terrill, who has written seven books on Steve McQueen. I interviewed Marshall for many hours and found him to be extremely honest and credible. Notice the first paragraph at the top of the second page which is seen below. 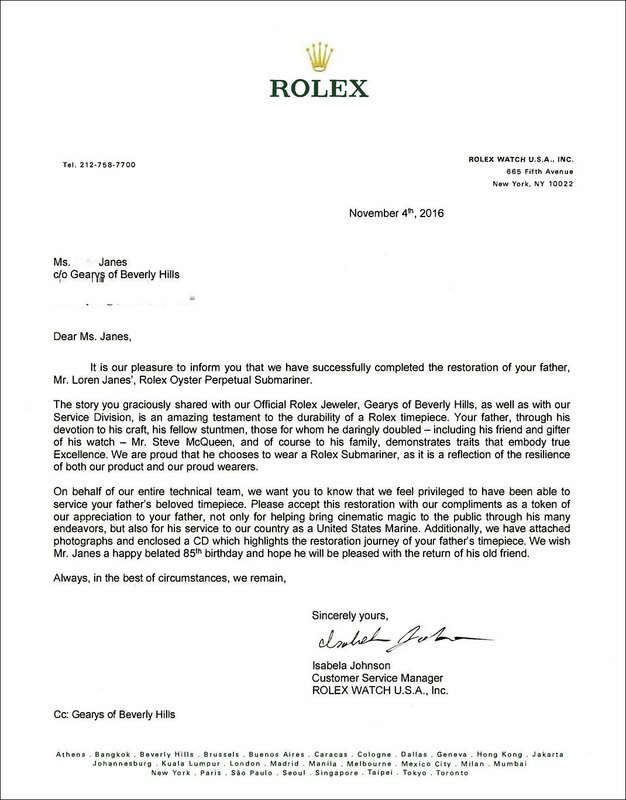 This confirms that Marshall Terrill personally witnessed Loren Janes Rolex Submariner around 1990 along with the engraving. "Loren had a healthy ego, there is no doubt about it. When I first met Loren Janes he was straight as an arrow." "In 2011, I remember reading that Wall Street Journal article and it sent shivers down my spine as I knew none of the stunt driving in Bullitt was performed by Loren. I knew this because many years earlier I interviewed Loren in detail about the stunt be performed in Bullitt running under the airplane. I also knew this to NOT be a fact as I had also interviewed Carey Loftin (stunt coordinator) and Bud Ekins (stunt driver) who worked on the chase scene in Bullitt. Reading that article literally made me cringe, but I believe I can explain why Loren Janes appeared to take credit for things he didn't do." Terril confirmed as did several other stuntmen when Loren Janes was filming The Sand Pebbles in Hong Kong in 1965 he was bitten by a poisonous pit viper snake. According to a 2013 study by the National Center for Biotechnology Information (NCBI), neurological complications are often directly related to the toxic effects of snake venom exposure. Marshall Terrill continued, "Loren was a Christian Scientist, and as a result, refused any medication whatsoever. Loren though he could recover by praying. Finally, when Loren was close to dying, some of his fellow stuntmen took him to a doctor who saved his life with medicine." "It's hard to say, but that snake bite could have had a long-term effect on his mental health, not to mention the fact that despite the fact Loren never broke any bones he suffered many concussions, which also could have contributed to Loren developing dementia when he was older." In 2001 Loren suffered a massive stroke. Marshal Terrill continued: "I was stunned to see how quickly Loren bounced back and seemed to recover completely from the stroke. I assumed this quick recovery was due to the fact he was in such amazing physical shape before the stroke, and sharp as a tack. I was planning to write a book about Loren but was not able to after his stroke as he started slipping away mentally. Also, it is a fact that one of the leading causes of Alzheimer's is a stroke. Loren and I co-headlined a Steve McQueen festival in April of 2011 and I practically had to babysit him the entire weekend, as his mental deterioration was so rapid. I noticed a BIG change in his demeanor and memory. This is around the time of the Wall Street Journal Bullitt interview when Loren was claiming he had driven many of the stunt car scenes in the movie. People who suffer from Altzhimers can often times seem perfectly normal. In other words, they can carry on what seems to be a perfectly normal conversation. The reality is that many people who suffer from different forms of dementia often try to cover it up by trying to seem like they are in control. In other words, they try to cope with their memory loss by telling people what they think they want to hear. I think that is what happened to Loren in that Wall Street Journal interview. I think the WSJ journalist was asking him questions and he couldn't remember, so he pretended to know in order to hide his dementia. This is speculation on my behalf, but that is what I believe. The last time I saw Loren in 2013, he was a shell of himself and I knew it was only a matter of time." I spoke with Steve McQueen's son, Chad McQueen regarding the provenance of Loren Janes Rolex Submariner. Chad said the McQueen legal team is working on this case and will release a statement as soon as they draw their final conclusions. Chad is pictured below in a photo taken in 1983 which was not so long after his father passed away and he is wearing his father's Rolex Submariner that he gave him. 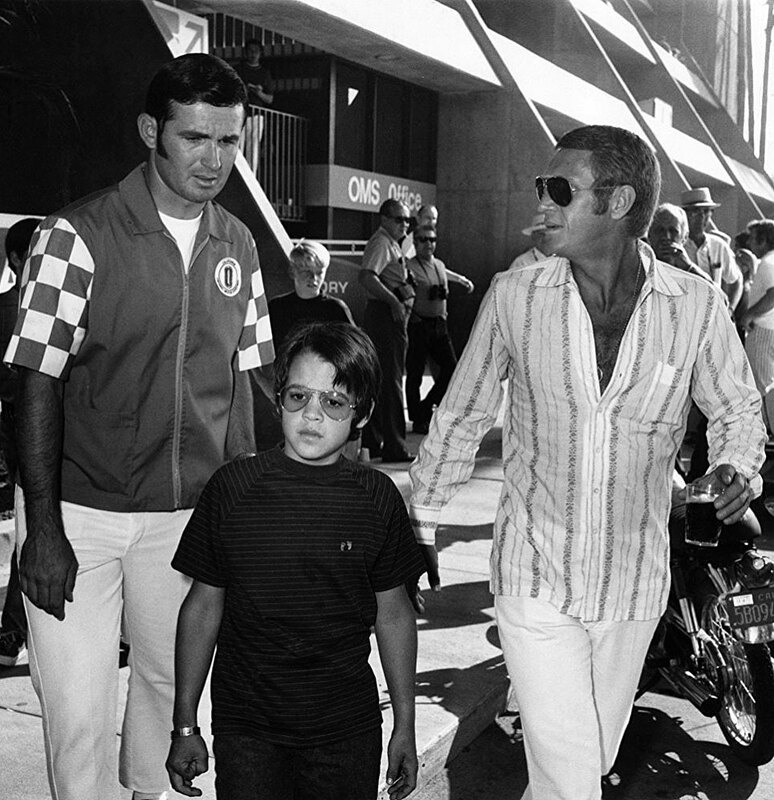 Steve McQueen is pictured below with his son Chad McQueen in September of 1971 at the California 500 Indycar race in Ontario, California. I spoke with Chad's attorney, Arthur Barens who congratulated me on doing such a great job in researching this story and so quickly putting together so many facts. Arthur said, "You are doing such an amazing job on this story Jake. I believe you deserve a Pulitzer prize for your writing!" Arthur also said he thought I was by far and away the most credible expert in this case and he was looking forward to reviewing my final assessment of this case. 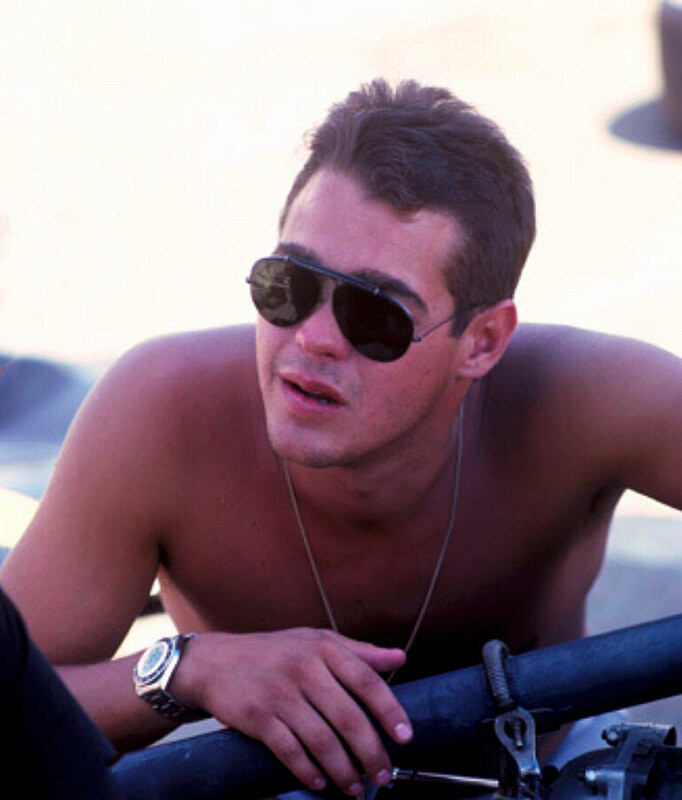 Chad McQueen is pictured below in a more recent photo still wearing his fathers Rolex Submariner. When it comes to provenance this watch undeniably possesses the most compelling of all. Erika introduced me to her brother, Eric Janes who was Loren's only son. 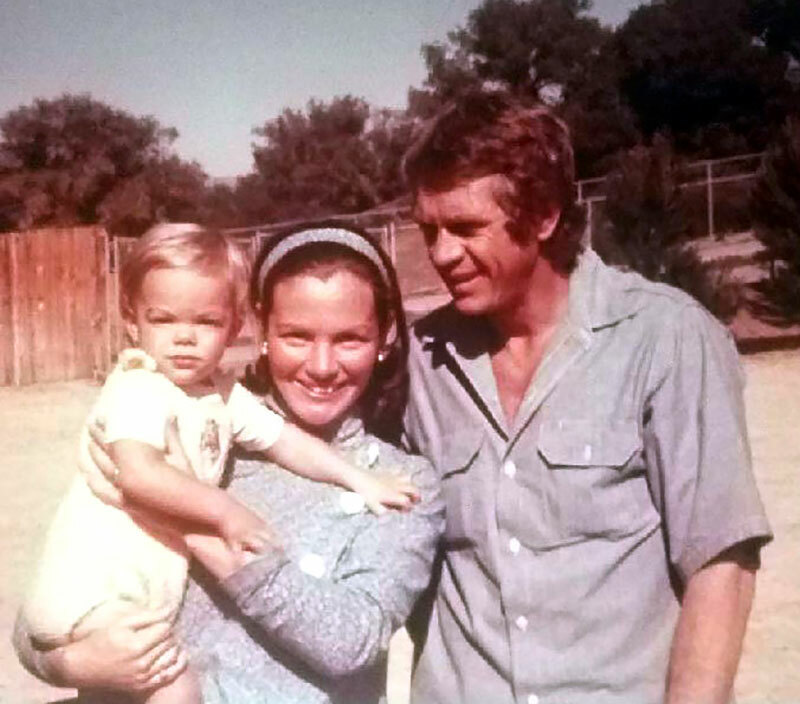 Eric is pictured below in 1969 in his mother Sylvia's arms, with Steve McQueen hugging them. 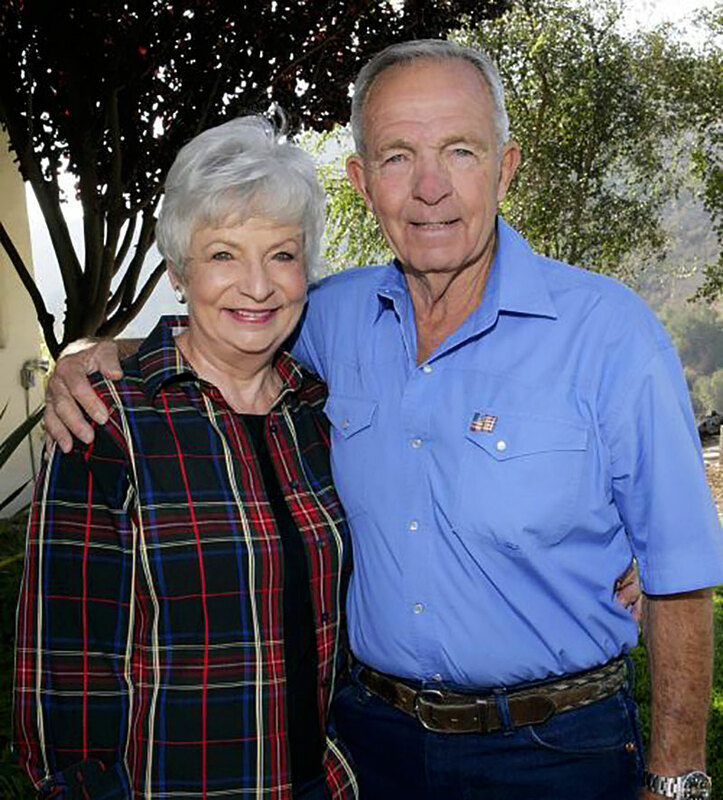 This photo was taken in Loren Janes Canyon Country home on Sand Canyon Road in his backyard. Eric Janes was 20 months old when this photo was taken, and his mother Sylvia was 8 months pregnant at the time. In other words, if you look closely, Erika Janes is also in this photo in her mother's tummy. It is ironic, but the little blonde dude in the photo above with Steve McQueen, close to a half-century after this photo was taken, would spend hours digging through the rubble of his father's decimated home (pictured below) which burned down to the ground, and would find the Rolex Submariner Steve McQueen had given his father more than a half-century earlier. I spent a long time interviewing Eric Janes. Eric is super low key and unpretentious. I found him to be extremely sincere and honest. In our interview, I asked him many pointed questions he could have evaded or twisted, but instead, he did the opposite. If anything he was self-effacing. "There are really only two things I remember about my dad's Rolex Submariner. First, I remember it was always on his wrist for as long as I can remember. Secondly, I remember my father telling me he and Steve were filming 'The Sand Pebbles' in Hong Kong when they went into a jewelry store and Steve McQueen bought two Rolex Submariner watches, and he gave my dad one of them." Of course, the next question I asked, was: "What happened to the second Submariner." Eric said, "I have no idea?" The next day I was talking with Stan Barrett on the phone and I mentioned I had spoken with Eric Janes who said he recalled his father saying Steve McQueen had purchased two Rolex Submariner models in Hong Kong and had given his father one of them while they were shooting The Sand Pebbles. "You know who you ought to talk to? Ronnie Rondell! Ronnie Rondell was a stuntman in the Sand Pebbles. At the time Ronnie Rondell was one of the top stuntmen in the world, and I really looked up to him. As a matter of fact, I remember Ronnie Rondell wore a Rolex Submariner back then, and I was so impressed, I went out and bought my first Rolex because I wanted to be like Ronnie." It took me a while, but I finally tracked down Ronnie Rondell's phone number. I called and left a voicemail for him. I also discovered there was another stuntman named Gerry Gattling who was also a stuntman on The Sand Pebbles. I got ahold of Gerry's number and called him. He had zero recollection of Steve McQueen giving Loren a Rolex. Gerry said, "Loren Janes was a very honest man. He didn't drink or smoke and was an amazing athlete. I remember working with Loren in the Battleship scene in Hong Kong." "If you want my opinion, I think it was a gift from Steve McQueen. Loren was really cheap and never would have paid to have someone engrave the back of that watch." The next day I got ahold of Ronnie Rondell's wife Mary's phone number. I called Mary and spoke to her. She said, "We got your message, but Ronnie is sleeping now. He had open heart surgery ten days ago and is recovering. I'll have him call you when he feels better." A few days later Ronnie Rondell called me back, and those two days seemed like an eternity. I asked Ronnie about his Rolex Submariner. He responded, "I flew over to Hong Kong for the Battle scene, and was only there for a few days. On my way back, I stopped at a jewelry store in the Hong Kong airport and bought a Stainless Steel Rolex Submariner and a Girard Perregaux gold dress watch. You wouldn't believe me if I told you how inexpensive they were. I only paid $200 for the Rolex Submariner!" I asked if he was aware of Loren Janes Submariner or Steve McQueen giving it to him to which he replied, "Unfortunately not. Steve probably gave it to him after I left. I can tell you Rolex Submariner models were really hot back then. Rolex was THE watch for stuntmen." I mentioned to Ronnie Rondell I had spoken with Gerry Gattling and that he told me he thought Loren was too cheap to pay to have the Submariner engraved, and Ronnie laughed and said, "I'll take you one further. Loren was so cheap, and tight with a buck, I don't think he would have ever bought himself a Rolex." 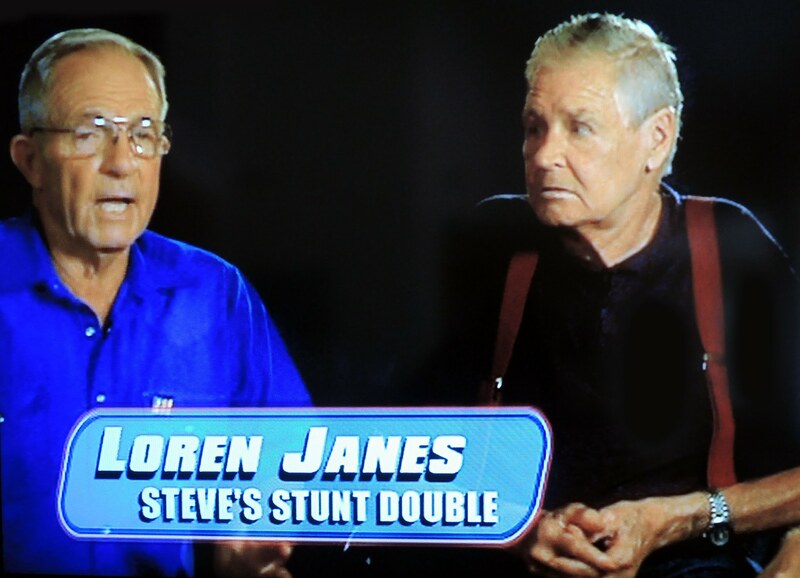 I ended up speaking with many more stuntmen regarding Loren including Chris Howell. 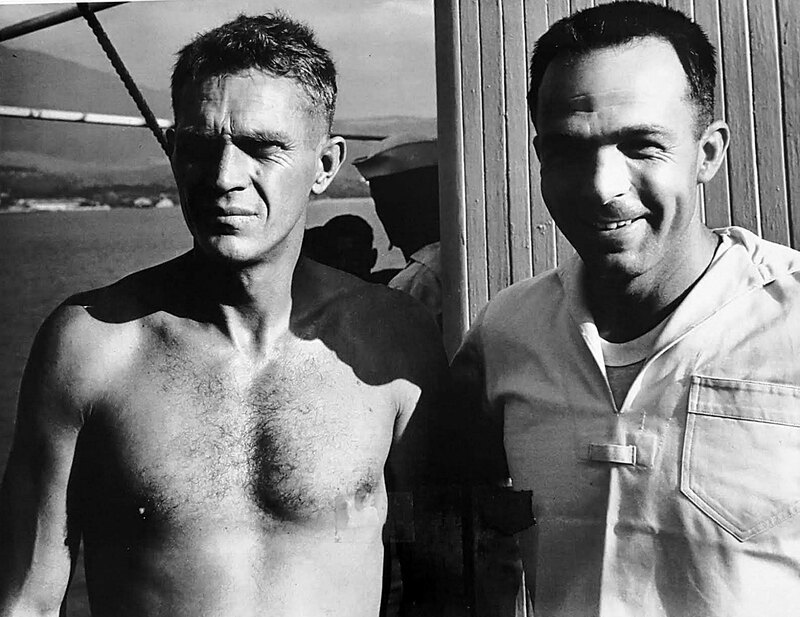 Chris mentioned Loren was bitten by a Pit Viper Snake while filming The Sand Pebbles and almost died. Chris Howell was a good friend of T. Walker Lloyd who was a Rolex U.S.A. executive who I recorded a podcast interview with years ago. Chris said, "Loren was so square, he was divisible by four, and he was so cheap, he never would have bought a Rolex." He laughed and then he said, "Loren was so cheap, he gave away homing pigeons for Christmas!" I could not help but notice there were a number of people who put forth theories of foul play in this case, and I must admit I initially suspected the same thing. From all of the evidence I collected and evaluated, including the countless conversations I had with people, I believe this story began with a calamity of errors and serious communication breakdown which resulted in being a huge nothing-burger. Or as Shakespeare would say, "Much ado about nothing." I originally thought Phillips auction house should have done a better due diligence job, but as I researched this story, I realized they would have likely ended up on IMDB.com, which would have been consistent with the provenance letter. I believe the one thing Phillips Auction house is guilty of is rationally irrational exuberance. In other words, after having successfully auctioned Paul Newman's Daytona for $17.8 Million, I see how they wanted this to be the perfect follow up, and it still may be. I interviewed Aurel Bacs and Paul Boutros regarding this case and found them to be extremely straightforward and genuinely helpful. They realized they did not get the initial facts straight as they relied upon and took for face value that the provenance letter was accurate. I believe Phillips tried piecing together the most plausible and precise history based upon the facts they had at the time. It's crystal-clear to they didn't initially have the facts perfectly straight. To the best of my knowledge, they plan to update their press release. Same thing with Forbes.com. I also believe Erika Janes made innocent mistakes regarding the provenance letter she wrote. I believe Michael Eisenberg, the current consigner is a generous philanthropist, as he told me that when the watch sells he intends to donate 1/3 of the proceeds to the Steve McQueen Boy's Republic, as well as 1/3 the to the Janes family. If you are not familiar, Steve McQueen was admitted to the Chino Hills, California Boy's Republic when he was fourteen years old on February 6th, 1945. Years later he returned to the Boy's Republic, as a significant donor. I think after Chad McQueen reads this story with all these new facts, I believe it is likely it will offer him valuable insight. After all, Chad was only 5 or 6 years old when his father, Steve McQueen would have given Loren the Rolex Submariner in controversy, so I don't imagine he would remember such an event. At this stage, it's unlikely anybody can unequivocally prove or disprove that Steve gave Loren the Rolex as both witnesses are deceased, but I believe the preponderance of the evidence put forth in this article strongly supports that such an event occurred. There is a game we teach our children in the United States which is named Telephone. In the United Kingdom it's named Chinese Whispers and in Singapore its named Broken Telephone. This game has many different international names, including Grapevine, Electricity, Whisper Down The Lane, Gossip, The Messenger Game, and Russian Scandal. This story very much reminds me of this internationally popular children's game where players form a circle and a teacher whispers a phrase in the ear of one child, who then whispers it into the ear of the next child. The children do this until it comes back to the first child, and inevitably the message always ends up having changed significantly. For instance, the teacher may initially whisper, "The boy walked to the store with his dog to buy some candy." By the time the message has been relayed through ten children, it ends up being something like "The purple ping pong ball ate a bucket of orange crocodiles." And I believe that is exactly what occurred with this story. After I wrote this story, I was reflecting on what had transpired, and it dawned on me that Loren Janes confused state of mind at the end of his life, seemed to carry over along with his watch and seemed to have rubbed off on all parties who participated in putting together this story before I took it apart and put it back to together again—so it now makes sense. In other words, the initial provenance was confusing non-sensical and murky at best. Now the provenance is much, much clearer relatable and historically precise. Also, this story has often times reminded me of Akira Kurosawa's Rashomon 1950 movie which won the Academy Award for Best Foreign Film in 1952. Rashomon was a movie where multiple people witness the exact same event and each recount it as a completely different story as their personal biases affect their recollection. Kind of like that Simon & Garfunkel song titled, "The Boxer" that has the line that says, "A man hears what he wants to hear and disregards the rest." I must admit I learned a great deal from researching and writing this article. I spoke to so many famous stuntmen and learned that stunts are a combination of magic, artistry, and the power of suggestion. I would like to especially thank Stan Barrett for his friendship and invaluable contribution to this story. Without his amazing insight, I NEVER could have told this story. I would like to thank Marshall Terrill for his invaluable contribution to this story. Marshall has written seven books on Steve McQueen and interviewed Loren Janes fifteen times. Marshall went through this entire story with me one word at a time to make certain all the details were as precise as possible. I would like to thank the Janes family for their invaluable contribution to this story, as well as for their great photographic contribution. Special thanks to Chad McQueen and Arthur Barens for their kind assistance and sharing their insight with me on this story. 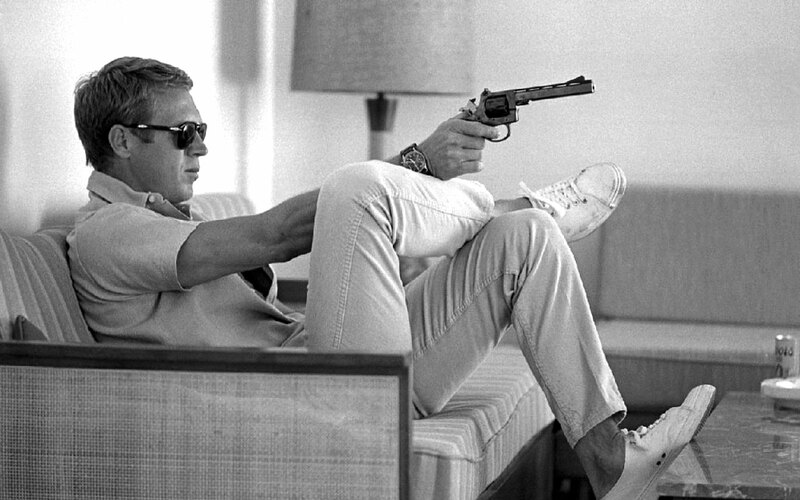 Also, as strange as this may sound, I would like to thank Steve McQueen for being such an inspirationally cool dude!!! You will ALWAYS be The King of Cool!!!! I would like to thank all the amazing stuntmen who knew and worked with Loren Janes, including Doc Dudamel, Billy Burton, Gary Combs, Mickey Gilbert, Stan Barrett, Gerry Gatling, Ronnie Rondell, DiaFarnsworthworth, Chris Howel, Jack Verbois, Rico Mancini, and Pat Johnson. Special thanks to stuntman and stunt-coordinator Gary Combs for so kindly sharing so much of his valuable insight with me on this story. 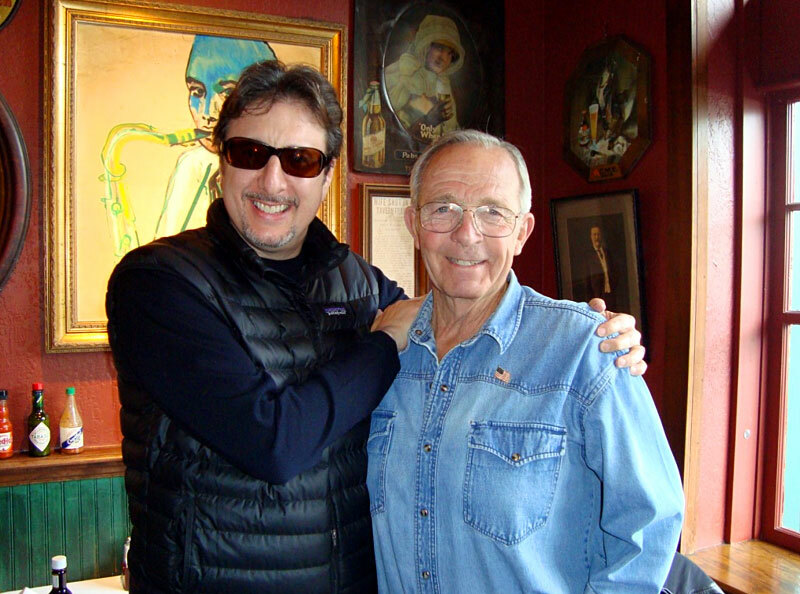 I would like to thank Don Nunley who was the property master on Le Mans with Steve McQueen. 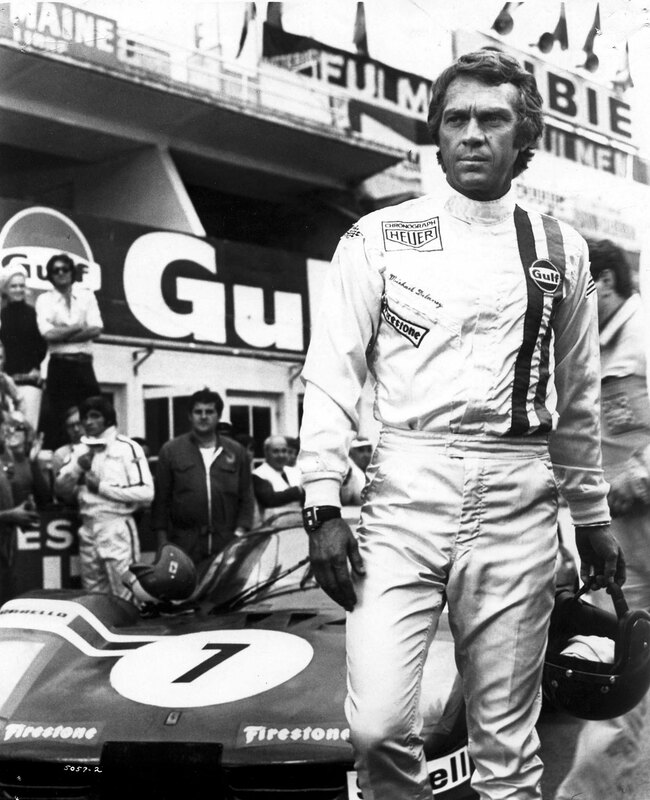 Don shared a great deal of fascinating information with me about the watches and Steve McQueen on the set of Le Mans. I would also like to thank Michael Eisenberg for his valuable contribution to this story and for clarifying around so many questions I asked him. I would also like to offer special thanks to Jose of Perezcope.com, who in my opinion is "The best damn horological investigator in the world!!!" I would like to thank Sumit of Revolution.watch who also helped with this story. I would like to thank Nick Gould from Quill & Pad who helped with this story and wrote an excellent article about Loren Janes Rolex Submariner. Special thanks to the very talented Cara Barrett from Hodinkee.com who wrote the original and follow-up stories on this subject on Hodinkee. Most importantly, I would like to thank many of my readers who constantly wrote in from all over planet earth to share their own invaluable research on this case. 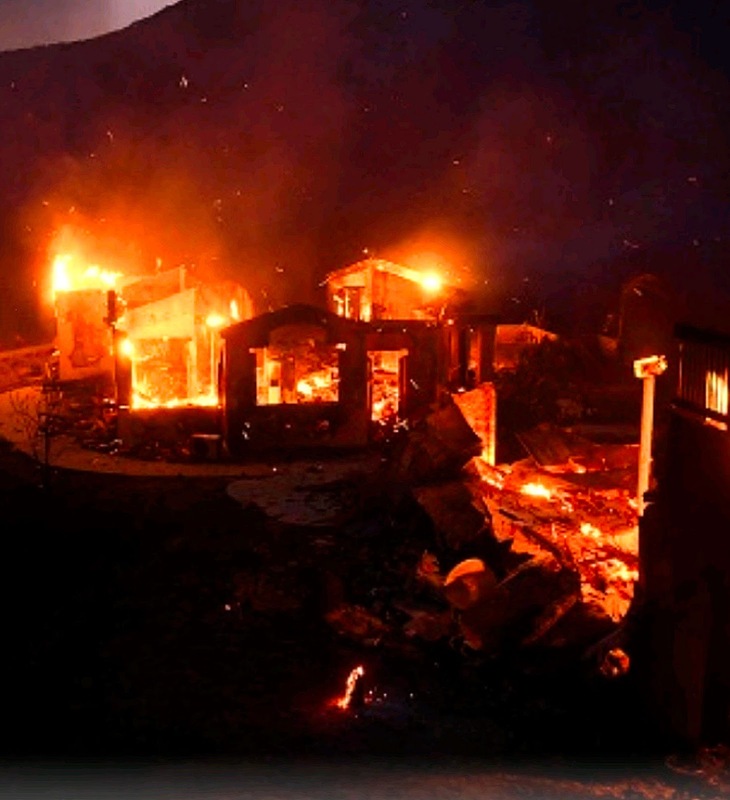 The photo below is an actual photo of Loren Janes home as it burned down to the ground. Everything was destroyed in the fire, with the exception of Loren Janes Rolex Submariner, which Rolex brilliantly restored. The photos above and above and below show what Loren Janes Rolex Submariner looked like after the fire and before the restoration. 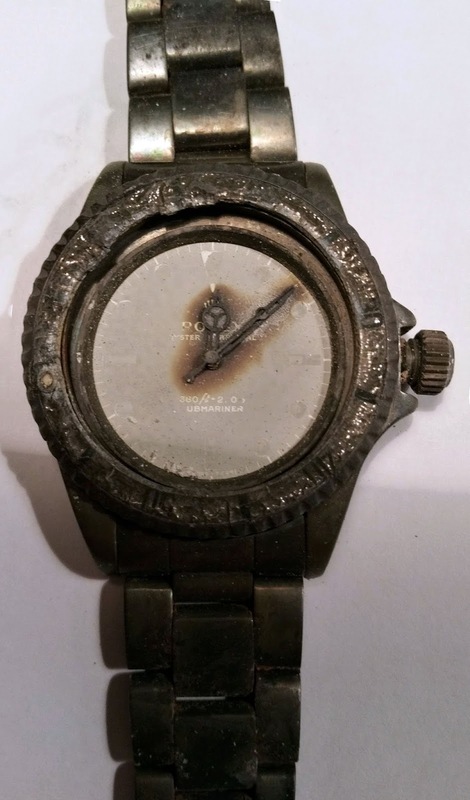 In the photos above we see Loren Janes Rolex with the severe fire damage. Below, we see Loren Janes Rolex after Rolex U.S.A. technicians were able to successfully restore the watch, which is pretty amazing if you ask me!!! 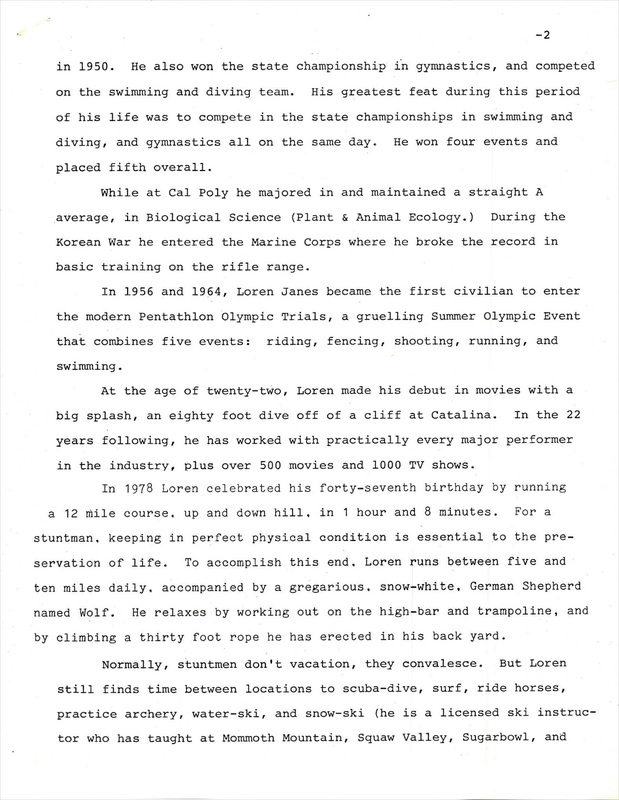 Loren Janes was an amazing athlete and very strong proponent of protections for stuntmen. He was a founder of the Stuntmen's Association of Motion Pictures which created much better safety standards and protections for the stuntman community. Loren wrestled for days with 27-foot anaconda snakes and stunt-doubled many famous actors including Kirk and Michael Douglas, Steve McQueen, Tony Curtis, Charles Bronson and Jack Nicholson. During his career as a stuntman, he had a horse step on his head, was bitten by a highly poisonous viper snake, and suffered from many concussions and close calls with death. 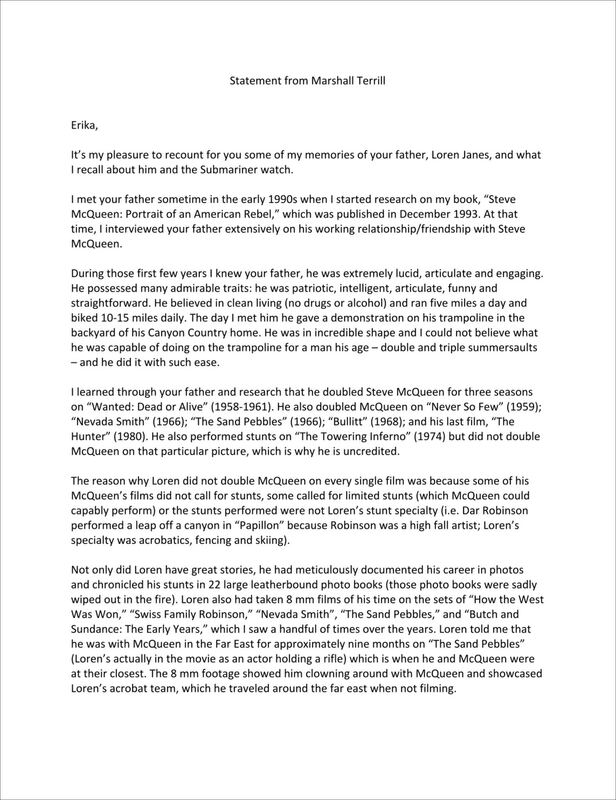 "Steve McQueen loved and respected Loren Janes and had a lot of faith in him! Loren was one hell of a stuntman. I learned a lot from Loren, and he was the best stuntman I ever worked with. Loren could do anything. 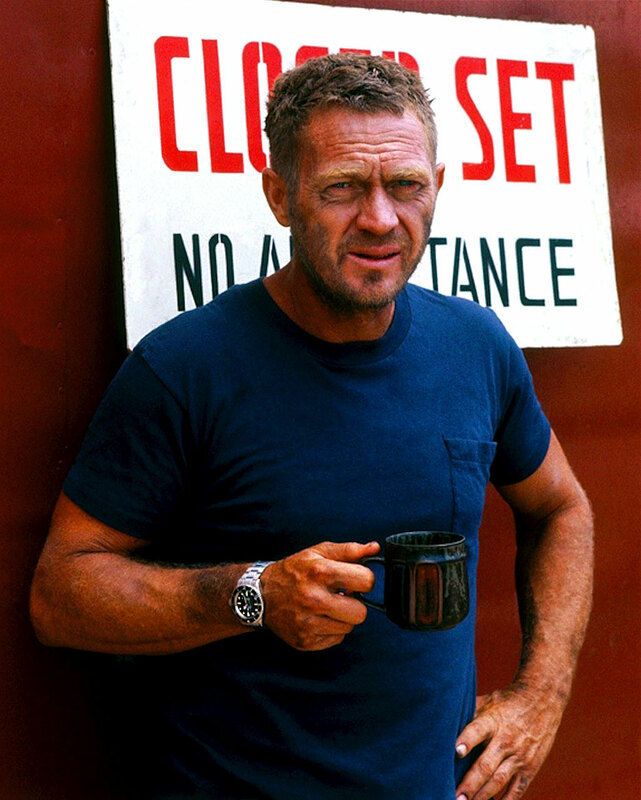 I believe it to be a fact that Steve McQueen gave Loren the Rolex Submariner on the set of The Sand Pebbles back in 1966." Many people I interviewed for this story knew Loren well. The vast majority of them believe the Rolex Submariner in controversy was indeed a gift from Steve McQueen. From all the evidence I have seen Loren Janes appears to be innocent, as his 2011 Wall Street Journal interview recollection can justifiably be chalked up to his advanced Alzheimers condition. 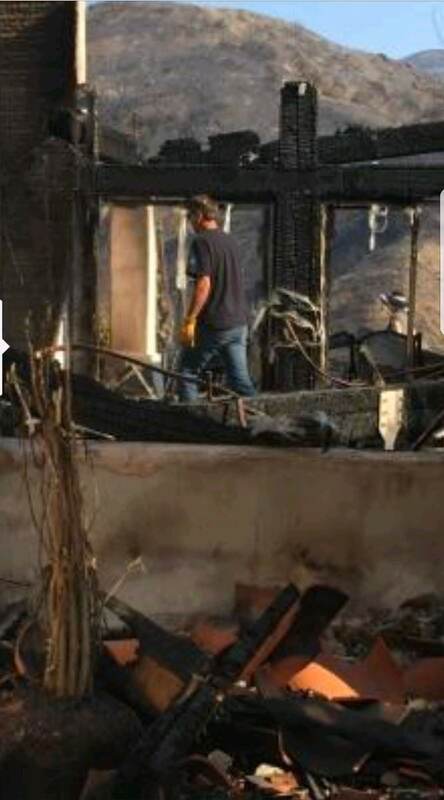 I spoke with a member of Loren's family, who lived next door to Loren Janes for two years before the fire that destroyed Loren Janes home. He really put things into perspective regarding Alzheimer's disease when he told me a story about how he discovered Loren walking around his home naked at 3:30AM desperately searching for his pet dog named Cindy who had died ten years earlier. Loren was able to carry on conversations toward the end of his life, but would commonly introduce his daughter and wife as his sisters. This story is heartbreaking and heartwarming at the same time. It is an expose on the human condition and it has significantly increased my understanding and awareness of dementia and Alzheimer's as I hope it does for you. 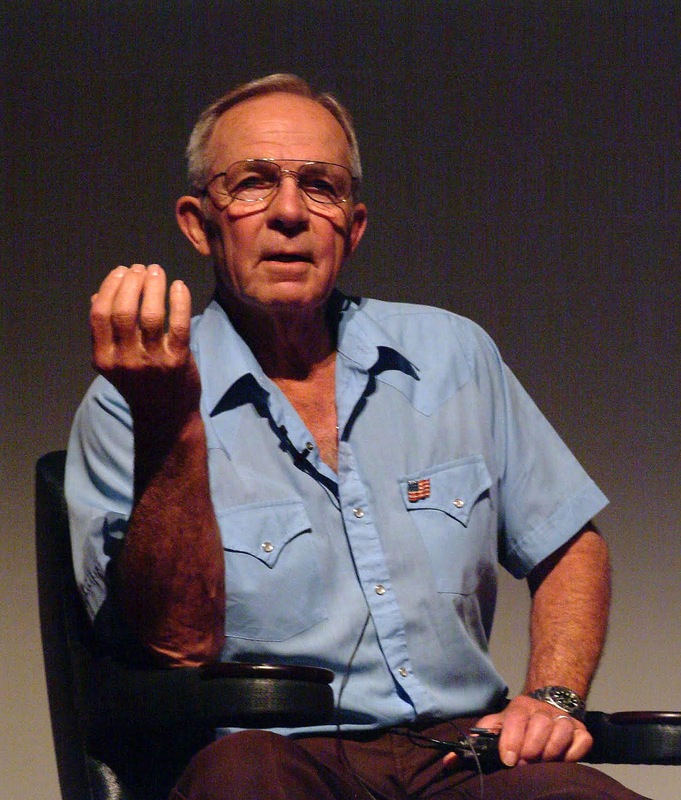 Loren Janes is pictured below in 2004 at the Virginia Film Festival giving talks about his career achievements. Photos below discovered by Nick Gould of QuillAndPad.com. Where is the second Submariner? Question 1: Assuming Eric Janes recollection was correct that Steve McQueen purchased two Rolex Submariner models in Hong Kong in 1966 when they were shooting The Sand Pebbles, then what happened to the second Submariner? Answer 1: It is hard to say at this point. 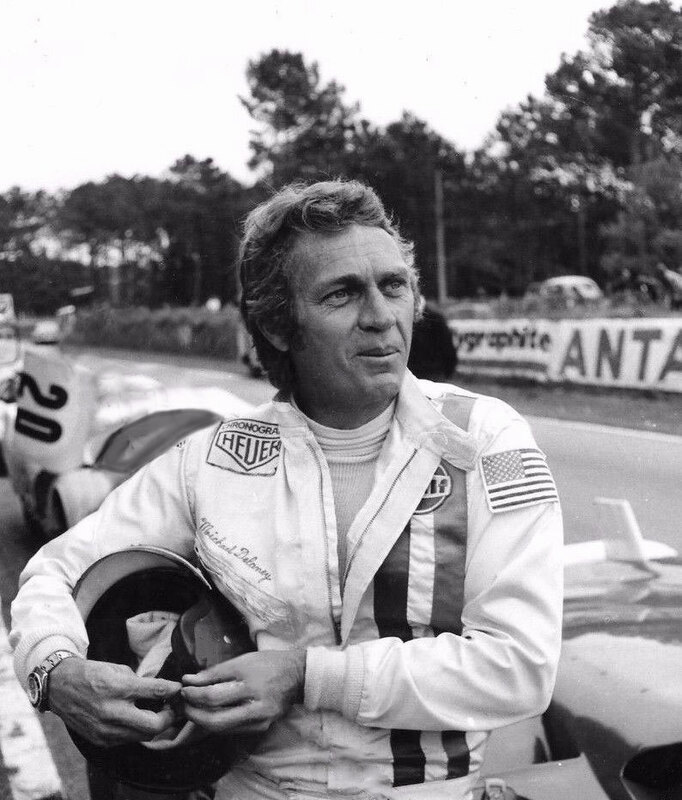 I can't help but wonder if Steve McQueen perhaps put it in a drawer and forgot about it for four years, and pulled it out and started wearing it in 1970 when he was racing at Sebring? It is possible that Steve McQueen wore the Submariner after he purchased it, but was not photographed wearing it. This seems unlikely to me as I have spent thousands of hours of my life searching for photos of Steve McQueen wearing his Submariner and have NEVER found one taken between 1966-1969. Why Happened To the 'Submariner' Text? Question 2: This question came in from Nick Gould who asked, "How come in one photo you can see the depth rating and in the other photo it's gone? Also, it appears somebody scratched off the depth rating and the word SUBMARINER?! Answer 2: I responded, "It's a great question. I assume the first image was taken soon after the watch was recovered. Since it was so damaged I assume Erica didn't baby the watch. Since neither the crystal nor the bezel was in place it would have exposed the dial to the elements as well as wear. Notice also that the minute hand got bent. 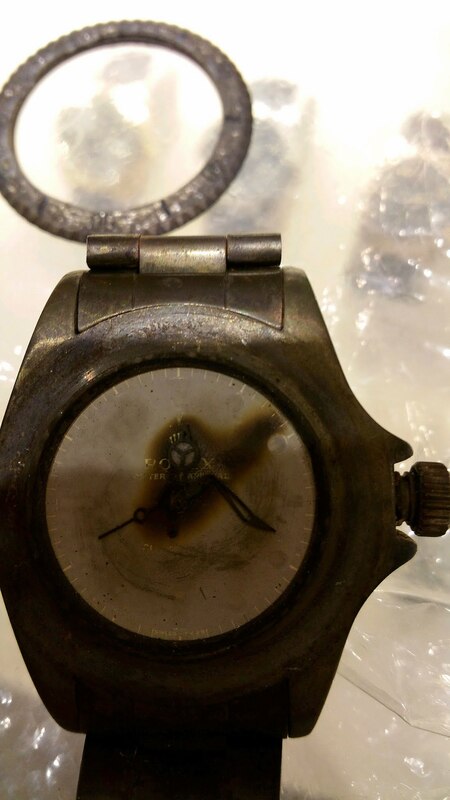 I assume the heat from the fire made the pad printed dial elements brittle, and the pad printed paint flaked off as the watch was moved around and exposed to the elements. I will reach out to Erica comment. Where is the Rolex Restoration CD? Question 3: Nick also asked, "Does Erika Janes have the CD from Rolex? Answer 3: If I recall correctly, the CD is with the watch @ Phillips. I will reach out to Erika and Michael to confirm this fact. What Happened To The Burned Dial? Question 4: What happened to the burned dial and bezel? Answer 4: A lot of people have asked this question. 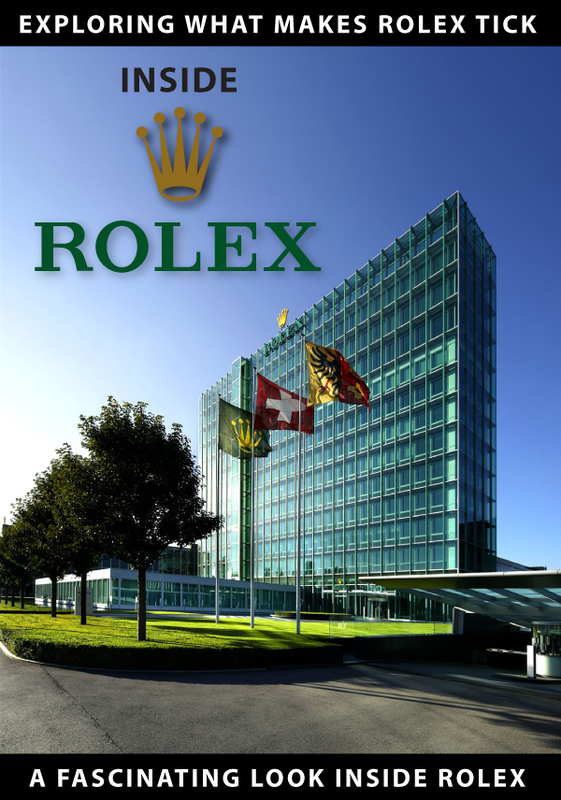 From all of my research, I believe Rolex U.S.A. kept the dial, which is standard procedure. In other words, if a person brings any Rolex in for servicing that requires replacement parts, Rolex replaces the part but does NOT return the replaced part. This leads the question of whether or not Rolex still has the burned dial and bezel, or did they discard them? I don't know, but I assume they would have kept them since this is a historically significant Rolex. Why Is There A 5512 Dial on Loren Janes 5513? Question 5: There has been a tremendous amount of confusion around dials on Loren Janes and I investigated this issue and will do my best to answer these questions. Answer 5: Loren Janes watch as it exists at this moment, has a Rolex Reference 5512 dial on it. 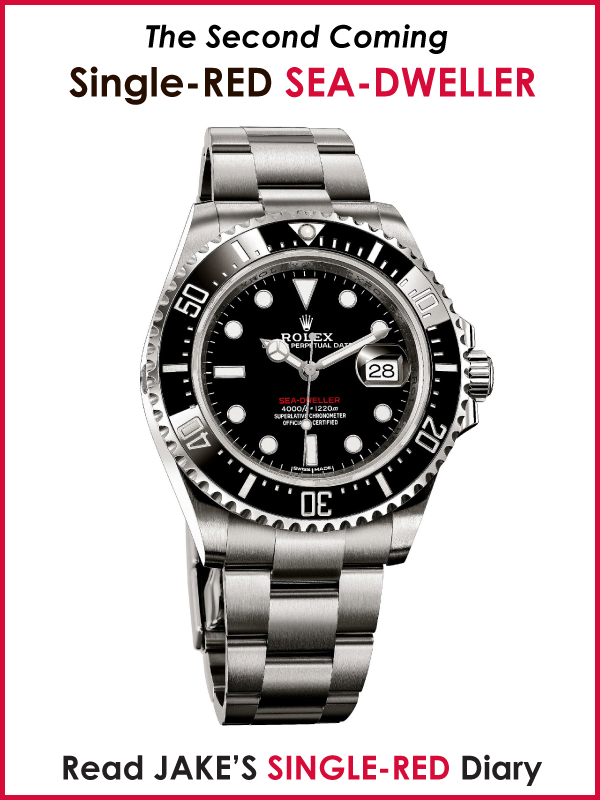 This is a point of confusion as his Rolex Submariner is a Reference 5513. I will do my best to share what is going on here. First, let's explore the difference between a Rolex 5512 and a 5513. The watches are very similar, but the 5512 was a more expensive watch as it had a COSC certified movement, and the 5513 did not. So what is the controversy? Here is where it gets even more confusing. Loren Janes 5513 would have originally come with a gilt dial, but the dial in the burn photos is NOT a gilt dial. As a matter of fact, it is a 'Feet First' dial, which means it did not have its original dial when it was in the fire. It makes sense it would have a much later service dial as it was likely replaced during a servicing. When Rolex U.S.A. restored the watch they did an amazing job, but for some reason, they put in a 5512 service dial, instead of 5513, which is really confusing. To confuse things even more, nobody knows if the watch has the original movement, or if Rolex replaced it because it sustained too much fire damage? If Rolex really wanted to restore the watch to the way it was when it was new in 1966, they would have had to put a riveted bracelet on the watch and they would have had to source a 1966 gilt dial, which would have been really expensive. It would have probably cost around $20k just for a pristine original gilt dial. Also, I assume Rolex thought they were restoring the watch so a family member would be able to wear it, not auction it. The current consignor, Michael Eisenberg went out and purchased an original 1966 Rolex Submariner 5513 dial in great condition with a matching handset, which he is including with the watch so the person who purchases the watch can make the watch more period correct. I believe Phillips mentioned this in their press release but did not show a photo of the optional dial which is included. Rolex Submariner On The Set of Le Mans? Question 6: Why was Steve McQueen wearing a Rolex Submariner on the set of Le Mans? Answer 6: I spoke with Don Nunley who was the property master on the Le Mans movie and I asked him this question. He told me that Steve only wore the Heuer when they were filming as seen in the photos below. By the way, I think the Heuer Monaco is on very cool watch!!! When Steve McQueen wasn't filming on the set of Le Mans he could often be found wearing his Rolex Submariner as seen in the photos below. I had a really profound conversation with Don Nunley about how he and Steve chose to wear the Heuer Monaco. "I asked Steve and he said, 'I don't like logos. I don't want to look like a walking/talking billboard.' I told Steve, that's the whole point of race cars and racing suits, is to be covered in sponsorship logos. Steve laughed. I told Steve he should look at what some of the race car drivers he liked had on their suits. A lot of the race car drivers Steve respected had Marlboro patches, but Steve said he didn't want one on his racing suit. Then Steve said, 'I noticed a lot of them have Heuer patches, why don't we do that, and I agreed. Next, it was time to pick the watch for him to wear. I had put together an assortment of Rolex, Omega and Heuer chronograph watches laid out on a table and brought Steve over to pick a watch. Keep in mind this was 1970 and the United States had just put a man on the moon. Steve Picked up an Omega Speedmaster, which was the same watch the NASA Astronauts wore, and said, I want to wear this Omega. I said, to Steve, that would look a little strange if you are wearing a Heuer patch with an Omega on your wrist. He agreed and picked up a Heuer Monaco with a blue dial and tried it on his wrist, and said, I like this." 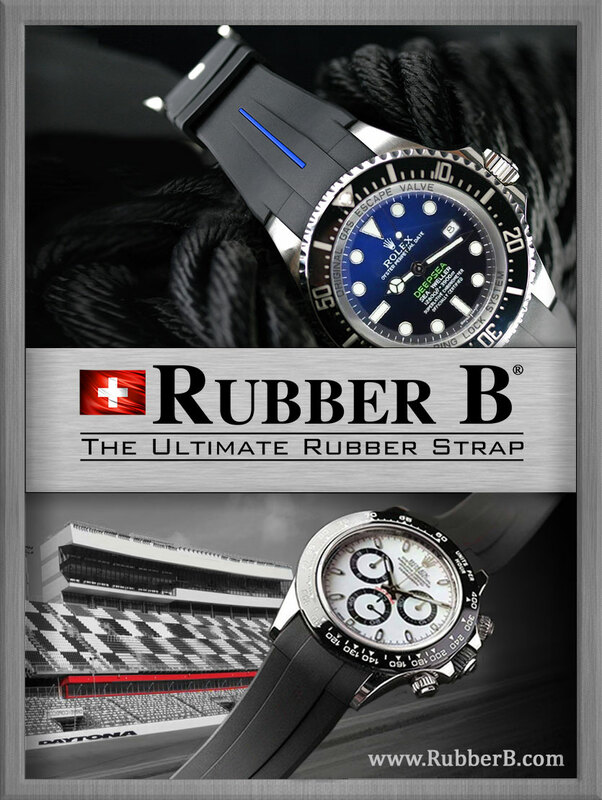 In the future, I will be doing a story on Don Nunley who is a Rolex guy and pioneered the world of product placement. 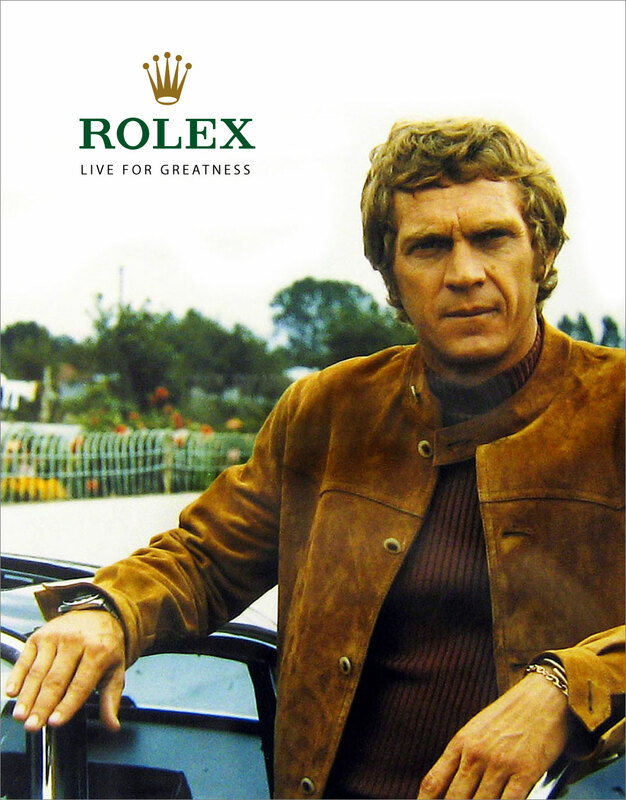 I asked Don if Rolex or T. Walker Lloyd gave Steve McQueen his Rolex Submariner and he said no. 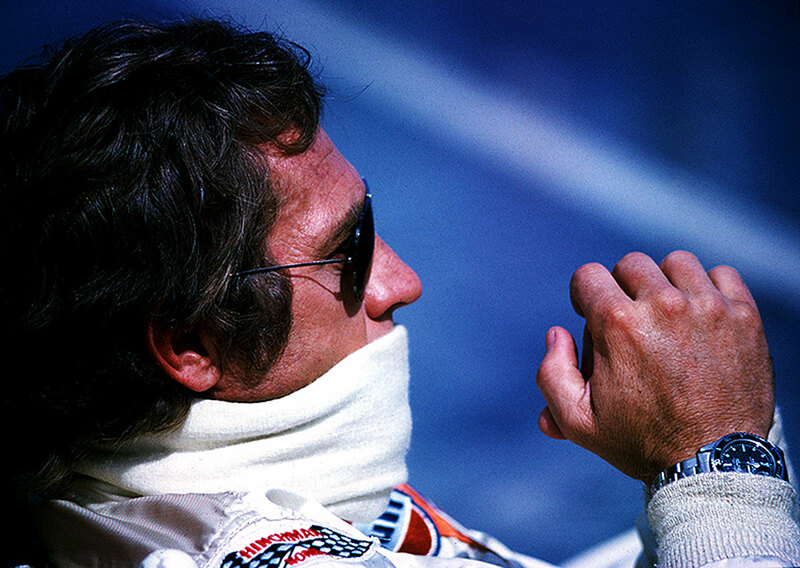 He said to the best of his knowledge it was Steve McQueen's personal watch. If you want to learn more about Steve McQueen's Rolex Submariner be certain to check out my original King Of Cool Story on Steve McQueen. Long Live The King Of Cool!!! Question 7: Ali v. Lee? When I interviewed Pat Johnson who was Steve McQueen's best friend, we had a very interesting conversation about martial arts. I practiced Karate for years when I was younger so we shared some fun stories. Pat Johson is a 9th-degree black belt who trained Steve McQueen in martial arts and self-defense. I said to Pat, "I have an interesting question for you?" Pat said, 'Sure. Go ahead!" I asked, "Ali v. Lee!?" Who wins and why? Answer 7: Without any hesitation whatsoever Pat responded, "Lee, of course. 100% of the time! I asked why? Pat responded, "Bruce would have almost instantly dropped Ali with a kick to the legs and dropped him, then Ali's height and reach advantage would have been gone. In close, Bruce would have wrecked Ali." On a side note, I have to point out I have wondered what the answer to that question was since I was a kid. I responded to Pat and said, "I never would have thought about that. What a fascinating answer!!!" Update June 28, 10:45PM PST: Jose, who is a brilliant investigator found this amazing story named, THE GREATEST CHASE OF ALL WHICH was originally published in Muscle Car Review in March of 1987 that details the entire car crew in Bullitt. Jose asked me where the image below came from? Tony Piaza Jr. sent it in after I published the story and he found this full-length documentary on the Bullitt Blue Ray DVD named The Essense of Cool from Turner Classic Movies. I am STUNNED as I write this update to this crazy/insane article that has taken more twists and turns than Lombard Street in San Francisco. Speaking of the streets of San Francisco, I have a Bombshell Revelation to share with you. How big of a revelation you ask? So big, I had to borrow Hodinkee's "BREAKING NEWS" moniker which is seen at the top of this story and blew it up even larger than normal!!! "I did see Loren Janes driving the Mustang in Bullitt. He did a good part of the driver doubling for the chase, including the final scene which concluded with the explosion and destruction of the Dodge Charger. Steve McQueen only did about 10% of the chase scenes in Bullitt. Loren Janes did the other 90% of driving the Mustang in Bullitt." —Tony Piazza Jr.
Who is our star witness in this case? 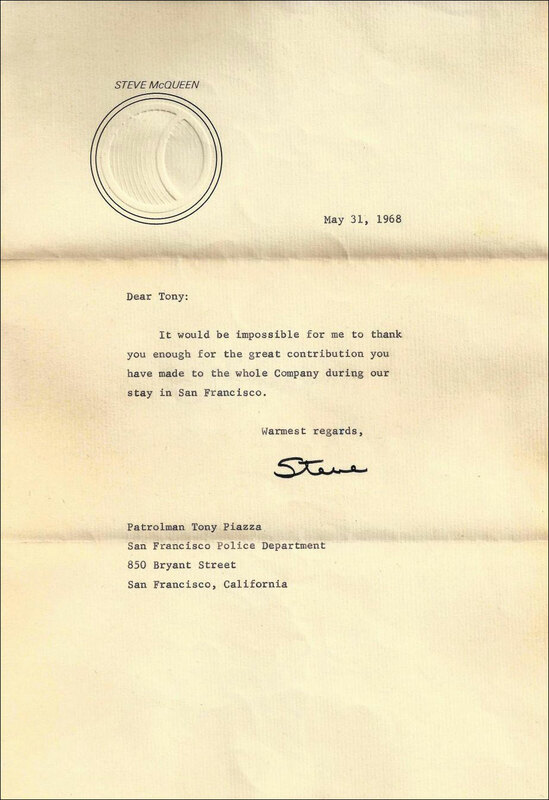 Tony Piazza whose father was the head of the San Francisco Police Department Movie Detail and is pictured above with Steve McQueen in the autographed photo that appears on Steve McQueen's Solar Productions letterhead. In my opinion, this represents a potential vindication of Loren Janes statements in the Wall Street Journal article in 2011 in which he claimed to have doubled Steve McQueen. Also, in my opinion, I am marking this as being CASE CLOSED. That does not mean I won't keep sharing new evidence as it continues pouring in on this historical case. 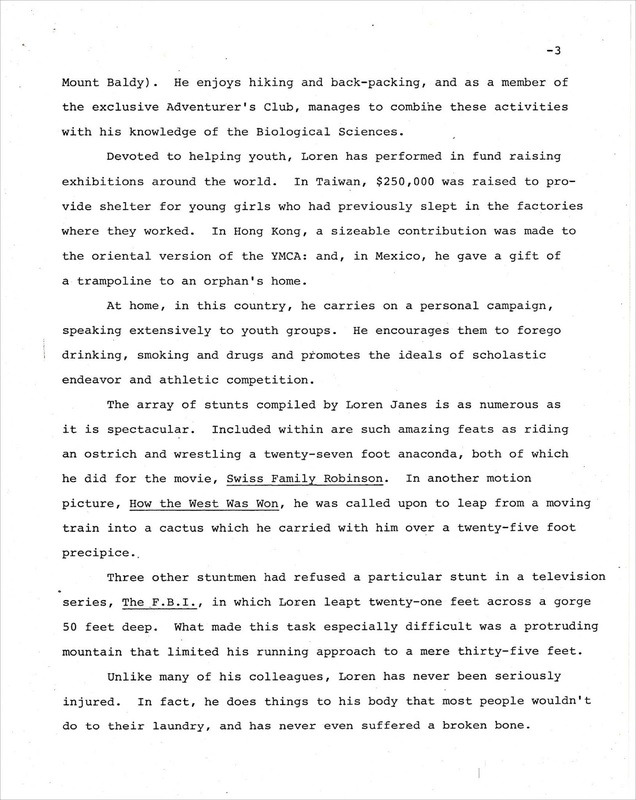 Stay tuned as I will be expanding on this new evidence as soon as I get a chance to further add context and update this story. THE BEST IS YET TO COME!!! Yesterday, after I published the story you see above all hell broke loose again!!! I spoke with Stan Barrett on the phone and told him about the new revelations from my interview with Tony Piazza. Stan Barrett said, "I don't believe it for one second. Loren was not a skilled stunt driver, and I believe if you dig deeper you will find I am correct." This was the last thing I wanted to hear as I thought I had discovered this profound new information. 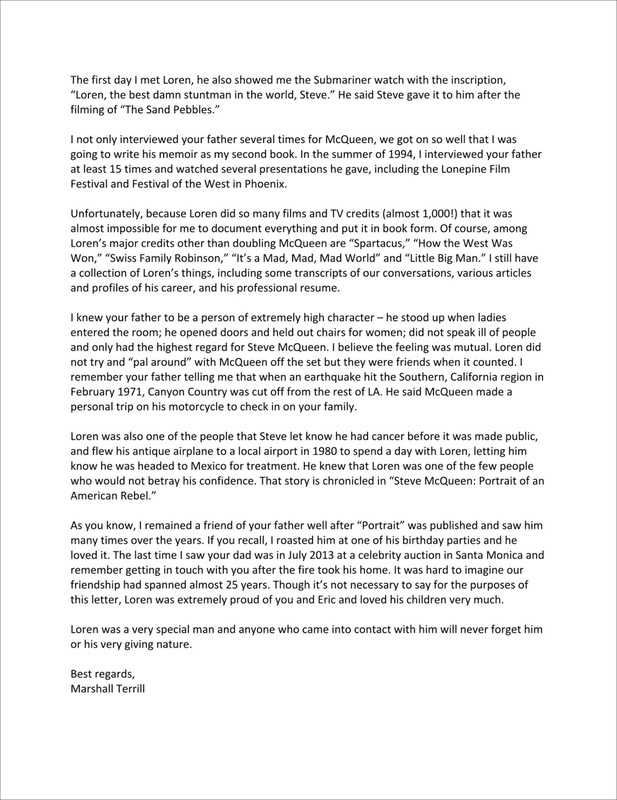 Next, I reached out to Marshall Terrill who is one of the top experts on Steve McQueen. 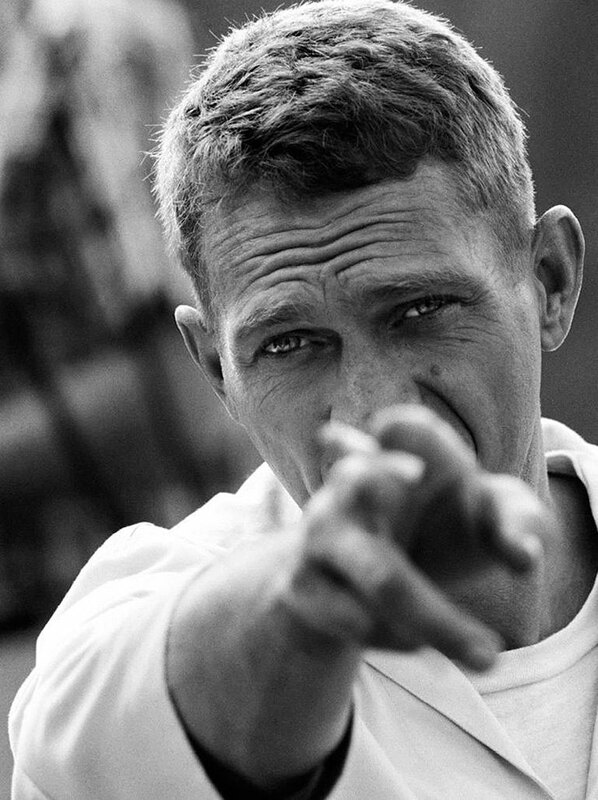 Marshall has written 7 books on Steve McQueen and is like a walking, talking encyclopedia on McQueen. Marshall said, "I understand where Stan is coming from. There are some significant inconsistencies with Tony's statement." I was so bummed, and said, "Look, Tony was so straightforward and honest with me. He really seemed to know what he was talking about and I find it hard to believe he would have lied to me!?!!" "Jake, I see nothing that leads me to believe Tony lied to you! I believe that everything he said was true. I read his book titled, 'Bullitt Points', but keep in mind Tony was 13 years old when he witnessed the filming of Bullitt on the streets of San Francisco. My best guess is that when he wrote his book he relied on articles that were published by others who had the record wrong." Marshall shared the absolutely fascinating video below that would suggest information to the contrary. The first video, which can be seen below is the first documentary ever made about Steve Mcqueen. I think it aired 6 years after Steve passed away. Marshall said, "Fast forward to the 34-minute mark and watch Bud Ekins recount the driving he did in the car chase." 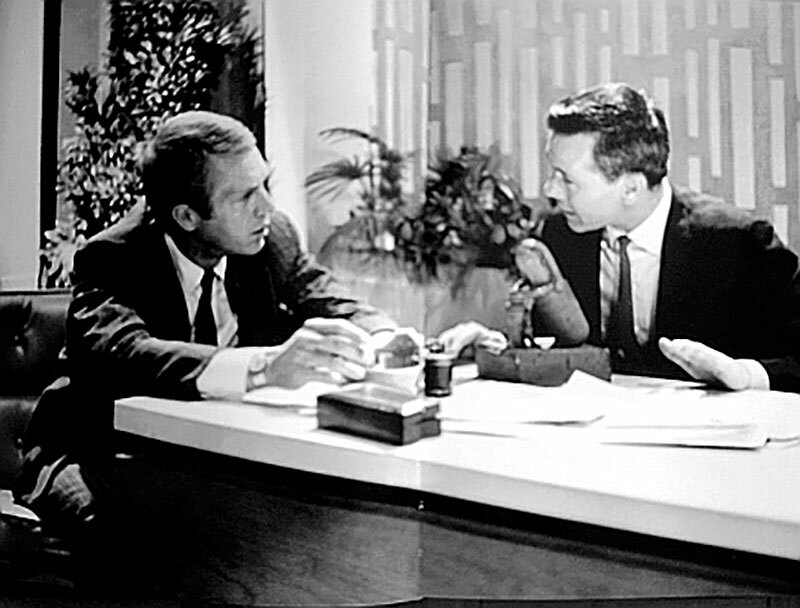 The photo below shows Steve McQueen on the Tonight Show with Johnny Carson back in the mid-1960s. In the interview, Johnny congratulated Steve McQueen for the amazing motorcycle jump in The Great Escape, and Steve responded by saying, "It wasn't me. That was Bud Ekins!" This fact really surprised everybody. Back in the old school, it was common for movie studios to hide the stuntmen to make the stars look more realistic. I called Tony today and mentioned I had some clarifying follow up questions. Keep in mind that Tony was 13 years old when he saw Steve McQueen shooting Bullitt on the streets of San Francisco. 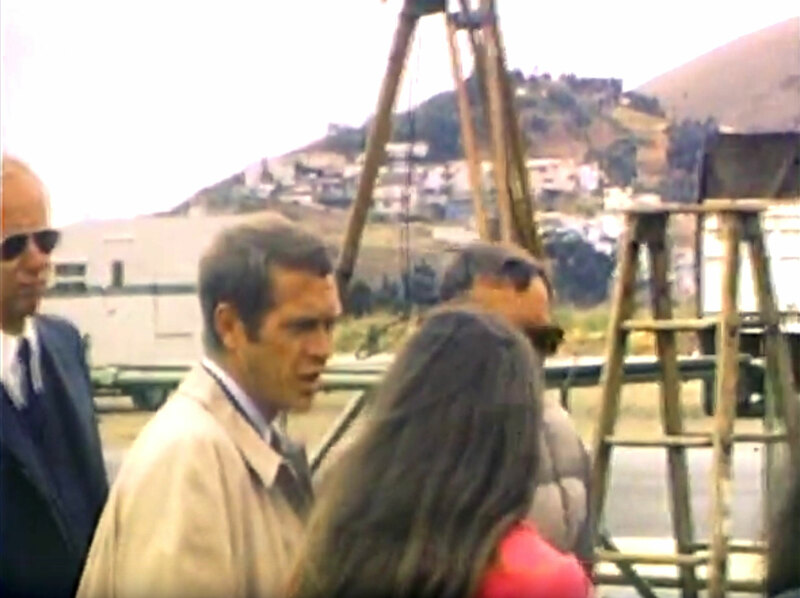 Bellow is a screenshot taken from 8MM film footage that Tony Shot on the set of Bullitt in 1968 and this one shows Steve McQueen in San Bruno. I asked Tony if he knew as a matter of fact that it was Loren Janes driving the Mustang in all the Bullitt scenes. He said, "I saw a stuntman driving the Mustang with my own eyes while Steve McQueen watched from the sidelines as seen in the photo above." I asked, "Did you meet and or speak with Loren Janes on the set? Tony said, "No." I asked, "Had you ever heard of Loren Janes before the filming of Bullitt?" He said, "I recall my father mentioning his name as he frequently worked with stuntmen." I asked, "How can you confirm for a fact it was Loren Janes driving the Mustang?" Tony said, "When I was doing the research for my book, named Bullitt Points, I did a lot of research on the subject of the drivers and that is where I got Loren Janes name." I went over the list of sources Tony had relied upon, which primarily included the Loren Janes Bullitt Wall Street Journal interview from 2011, which appears in my last story on this subject. Basically, every source we covered that mentioned Loren Janes was written after the Wall Street Jornal article, and Tony's book was written and published in 2012. Tony was EXTREMELY straight-forward and boy-scout-honest. He concluded by saying, "I depended on what I thought was an accurate historical record, that now seems to be inaccurate." Tony mentioned he was going to dig deeper into his records and get back to me if he was able to find anything more on this subject. I would like to point out that there are a number of articles floating around on the internet that claim that Loren Janes drove the Mustang in Bullitt, and they were ALL written after the Wall Street Journal article, which would explain this historical inaccuracy. Tony's father, Tony Piazza is pictured below with Steve McQueen during the shooting of Bullitt on Potrero Hill in San Francisco in 1968. Tony asked me to make a clarification that he mentioned yesterday when I interviewed him. I said that Tony's father Tony Piazza Sr., was the head of the San Francisco Police Department Movie Detail, which is true in that he was the officer who dealt directly with the studios, director, and actors on location, but he reported to Sergeant McCarthy who oversaw the movie department of the San Francisco Police Department. This next image is profound as it shows the sons of the two men pictured above. Below we see Tony Piazza Jr., who wrote Bullitt Points which was based upon his experience as a 13-year-old boy watching the making of Bullitt. 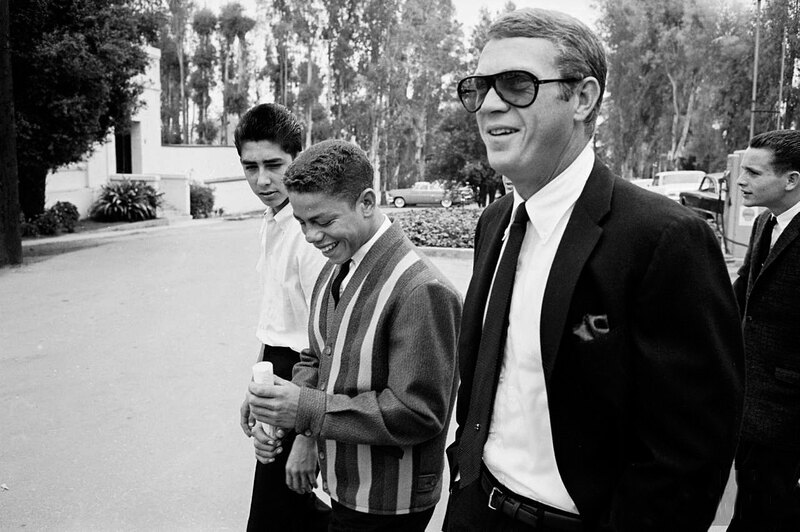 Standing next to Tony in the photo below, we see Chad McQueen who is Steve McQueen's son. 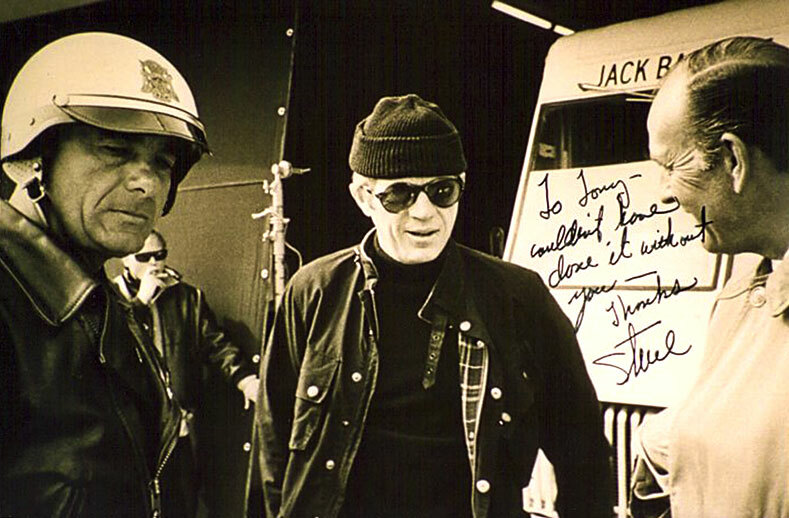 I discovered Tony and his story the night before yesterday when I stumbled into a blog post he had written back on January 10, 2012, named, "On the Set of Bullitt with Steve McQueen by Tony Piazza" in which he mentioned he had witnessed Loren Janes driving the Mustang in Bullitt. Yesterday, when I first interviewed Tony, I was beyond excited!!!! I was so overwhelmed that I didn't dig deeper as I should have. I think the lesson I learned is to be more careful with publishing "BREAKING NEWS" stories. It was a 100% honest error in retrospect on behalf of Tony and myself. I rushed to share what I thought was great news with you, my readers, but when I dug deeper realized there were some issues. I have done what I always do which is to take a Dragnet-like approach, "Just the facts Ma'am."